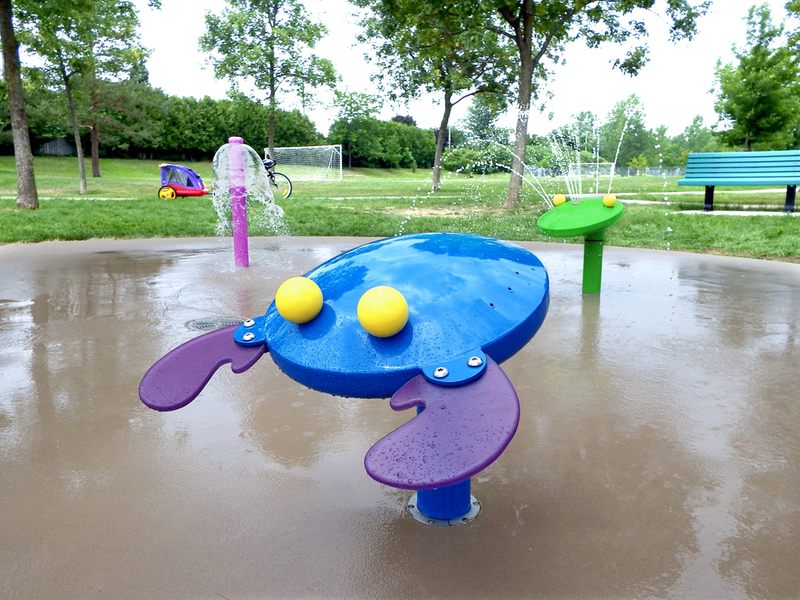 More than $150,000 in aquatic play components. 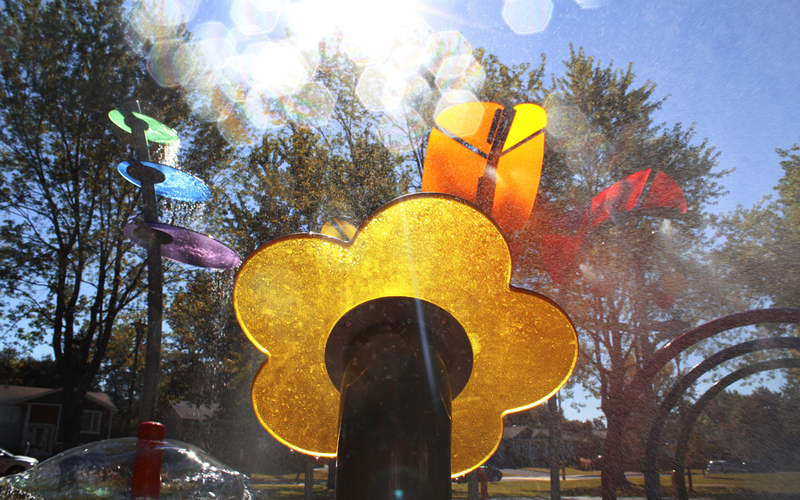 Evocation of a natural garden. 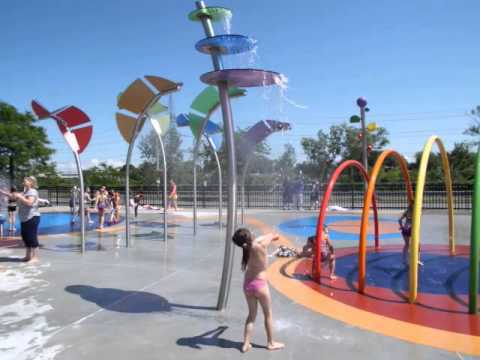 Several interactive and dynamic water features. 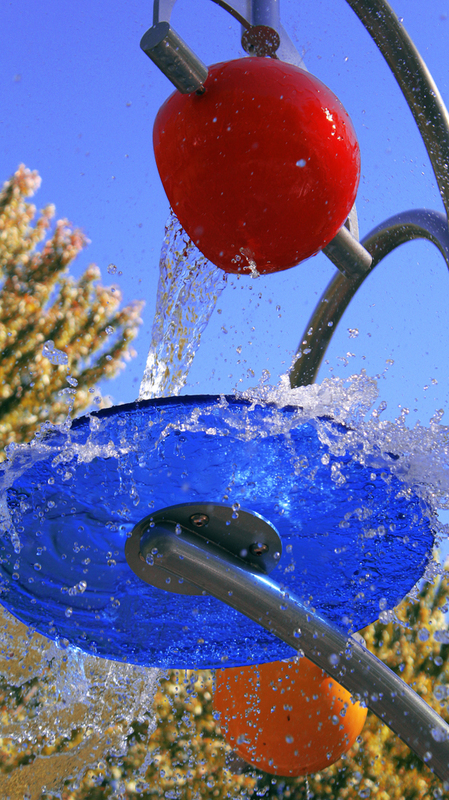 Patented mechanical control Step'n Play for direct control by the user. 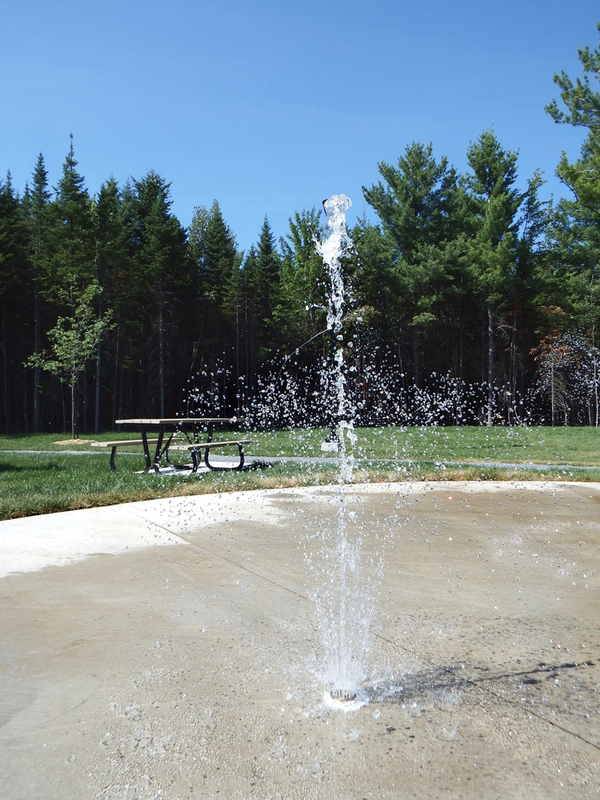 Water management maximized by the use of specific controls and Econosoft nozzles. 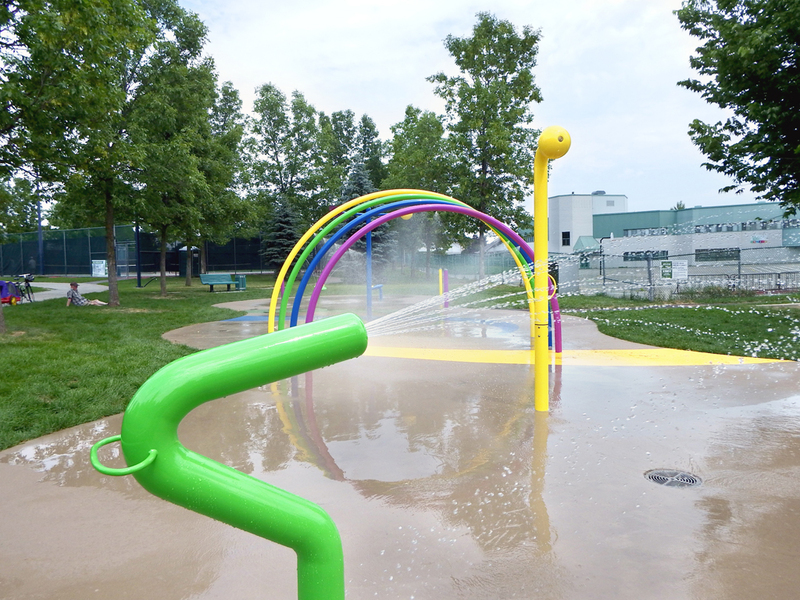 All structures are mounted on Aquajeux Unifix anchor device. 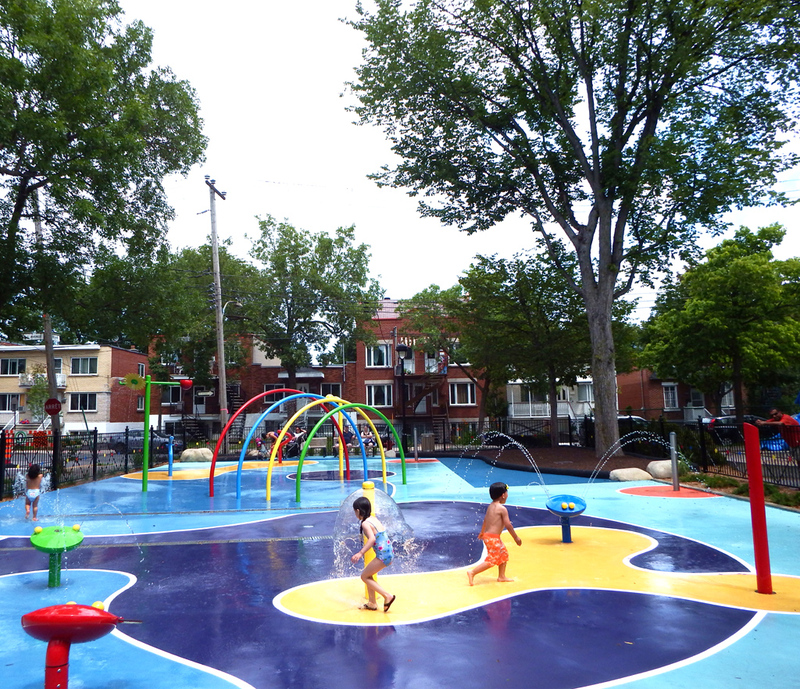 One of the most important project of the past 10 years in Quebec. 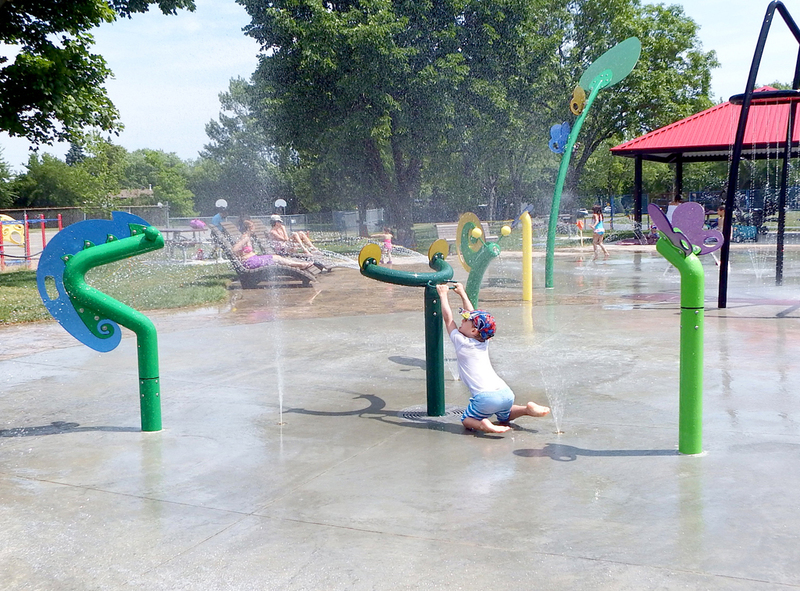 More than $ 250,000 in aquatic play components. 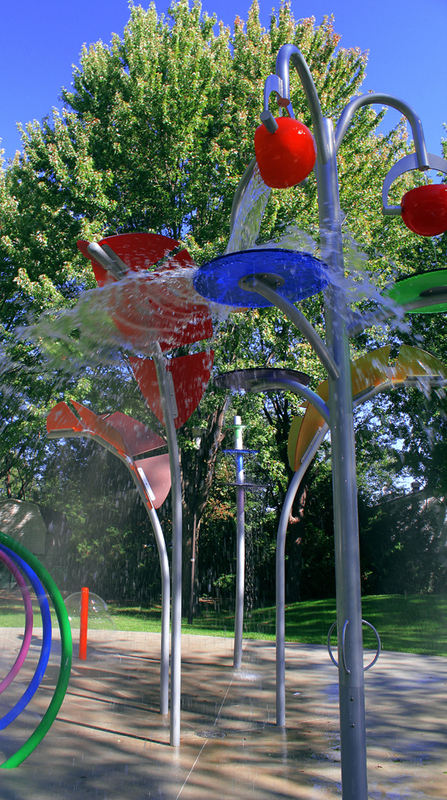 Evocation of chromatic and kinetic art using variations of primary and complementary colors in a specific order. 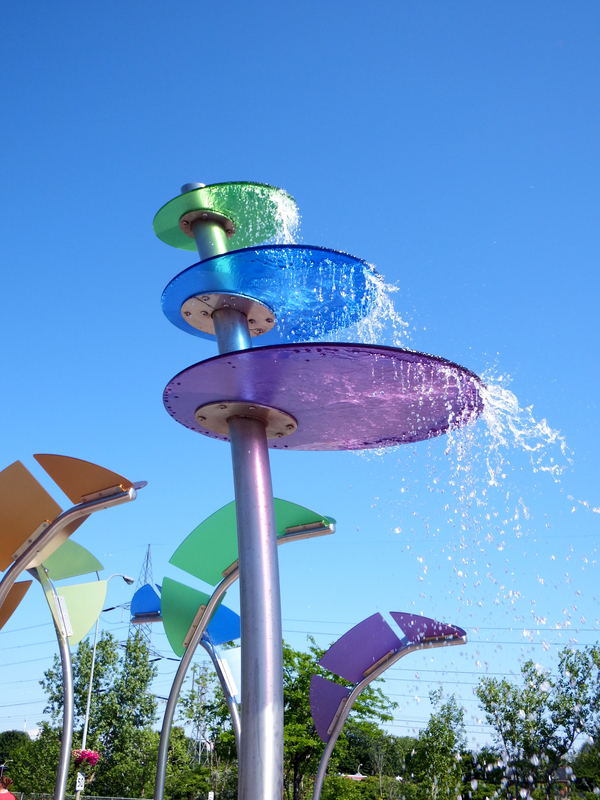 Several interactive and dynamic water features. 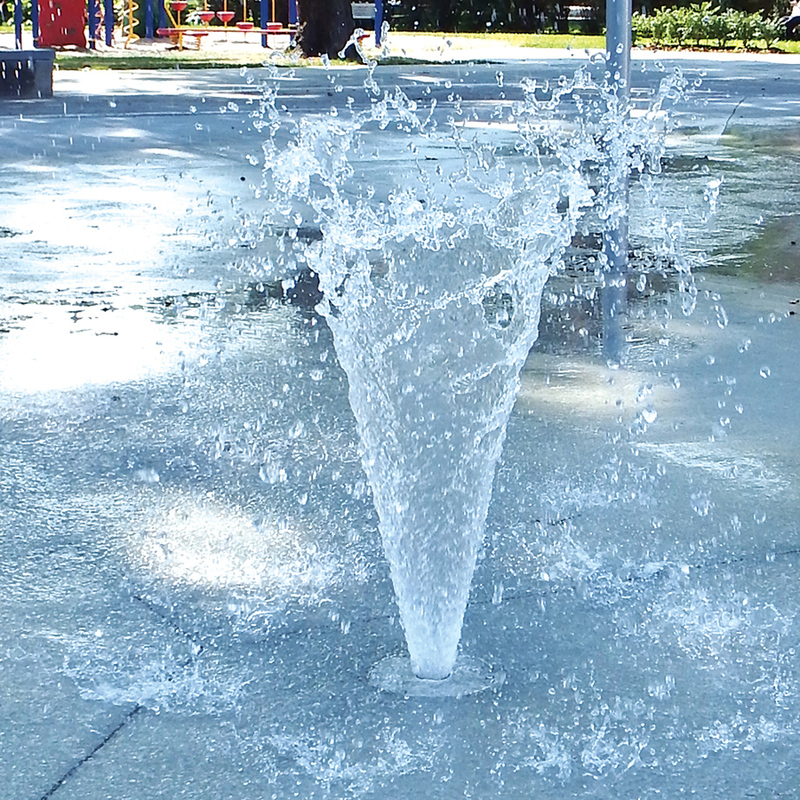 Patented mechanical control Step'n Play for direct control by the user. 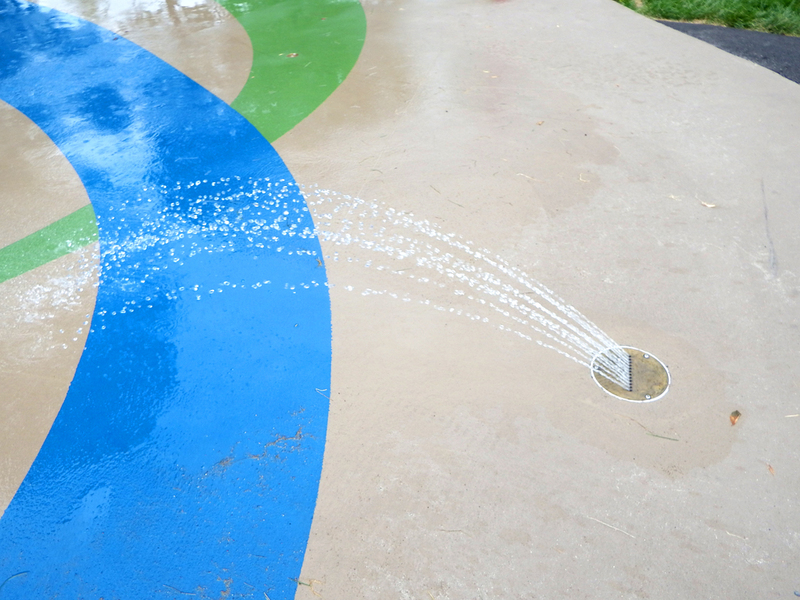 Water management maximized by the use of specific controls and Econosoft nozzles. 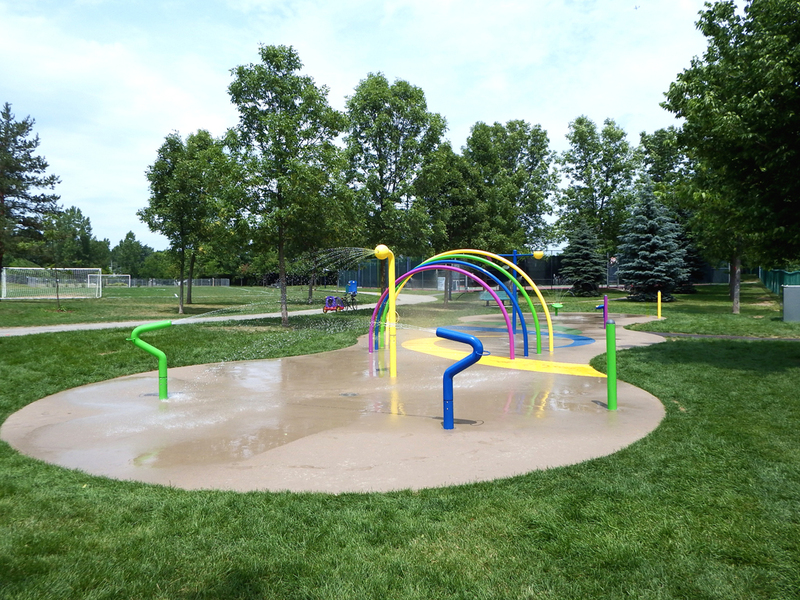 All structures are mounted on Aquajeux Unifix anchor device. 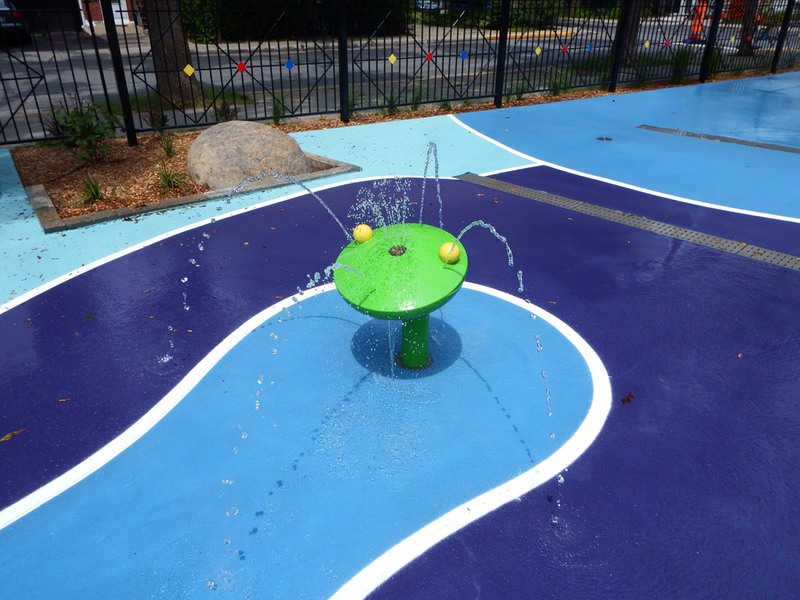 Pond and Insects thematic with our Gi-Ant surronded by 3 spray zones for each age group. 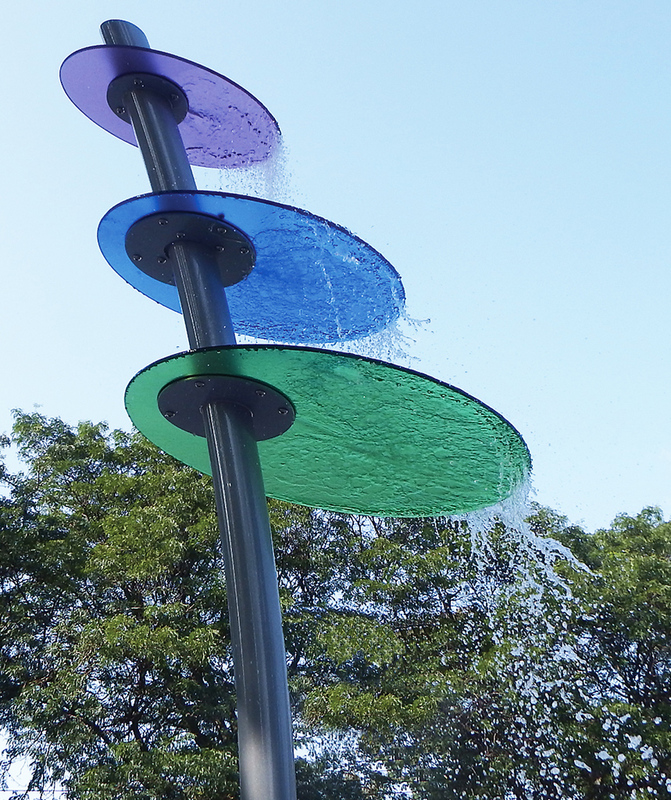 Take a look at our new cannons: Cameleon, Slug and Double Frog. 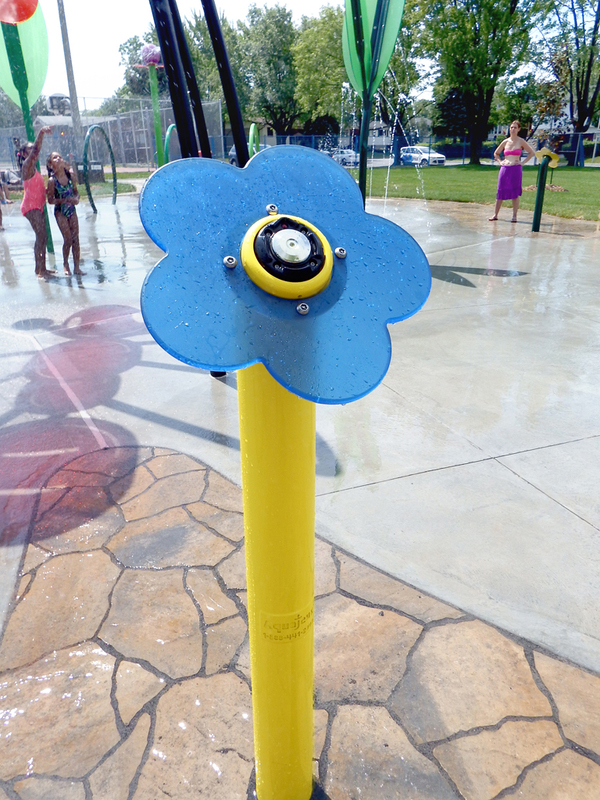 All our cannons are equipped with our unique Step'n Play activation device. 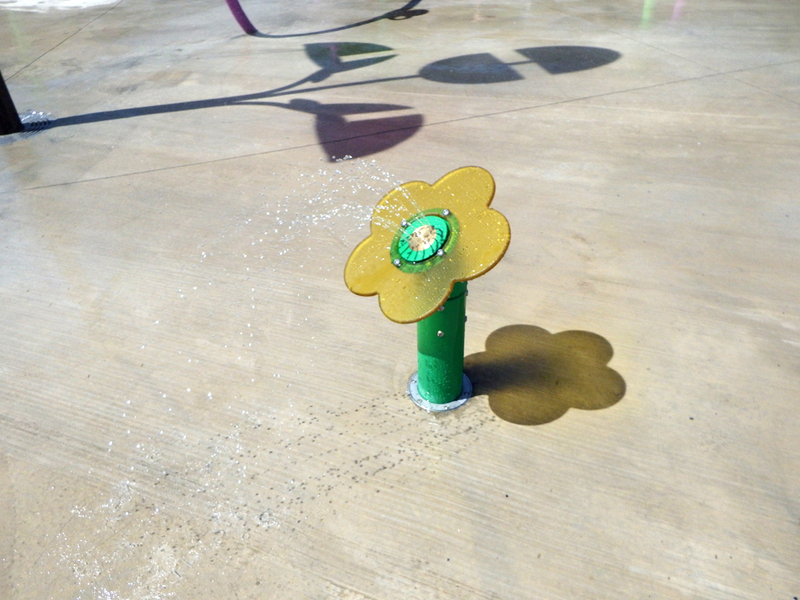 We also included in this pray pad our new Thistle. 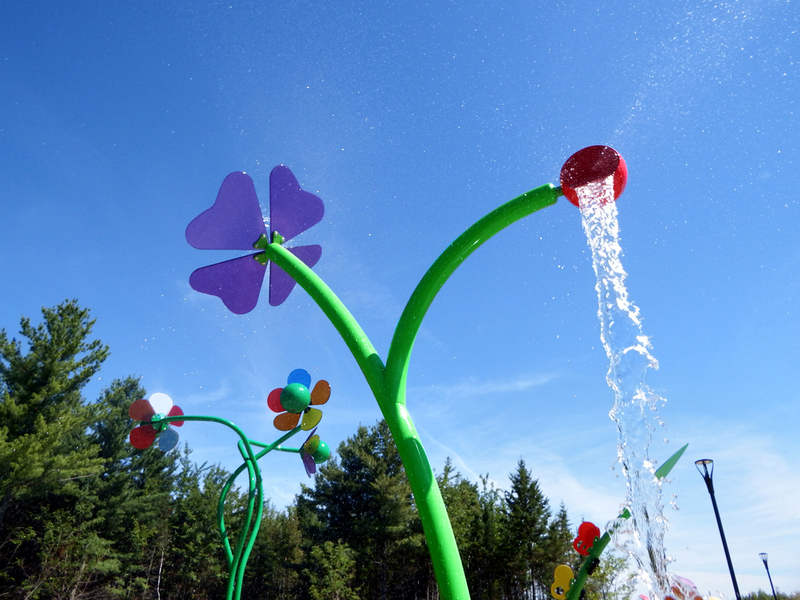 Moreover, 2 Grass Blades with gentle water streams add a touch of green. 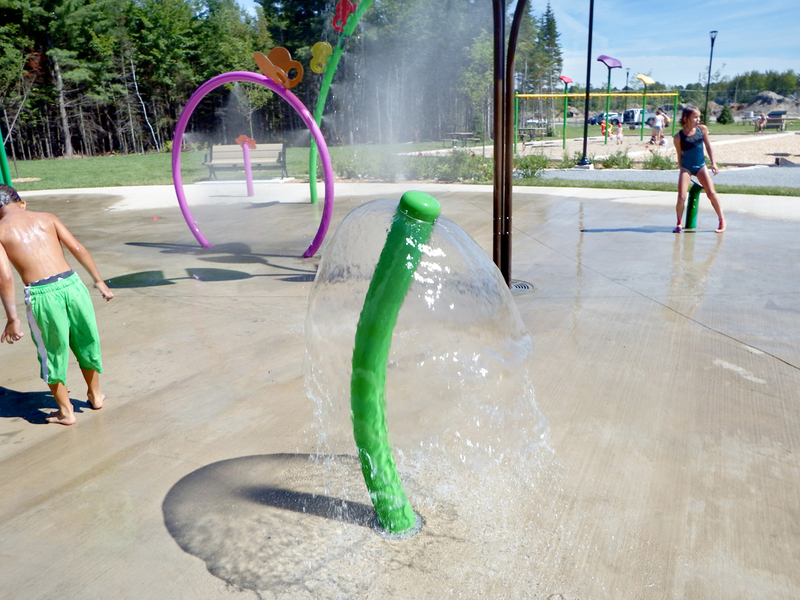 This water play area is composed of ground jets almost exclusively. 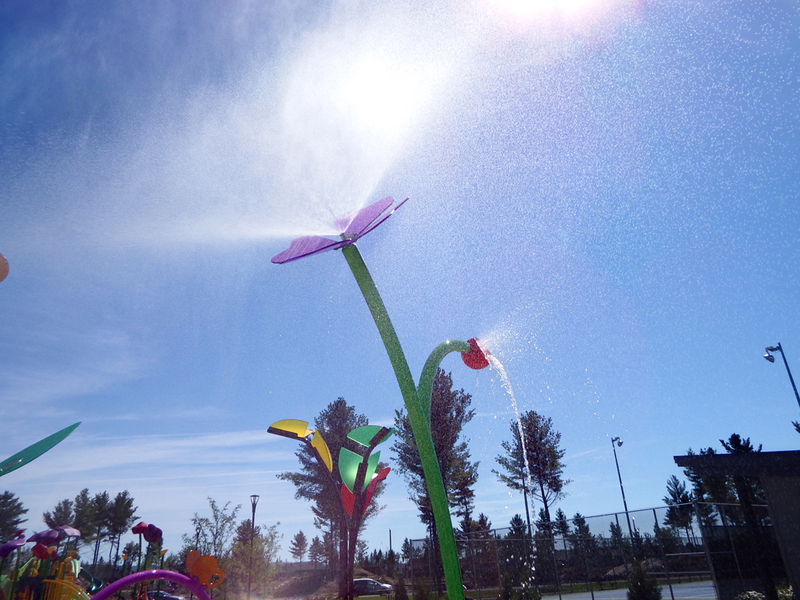 2 water cannons were installed to provide an interaction with users. 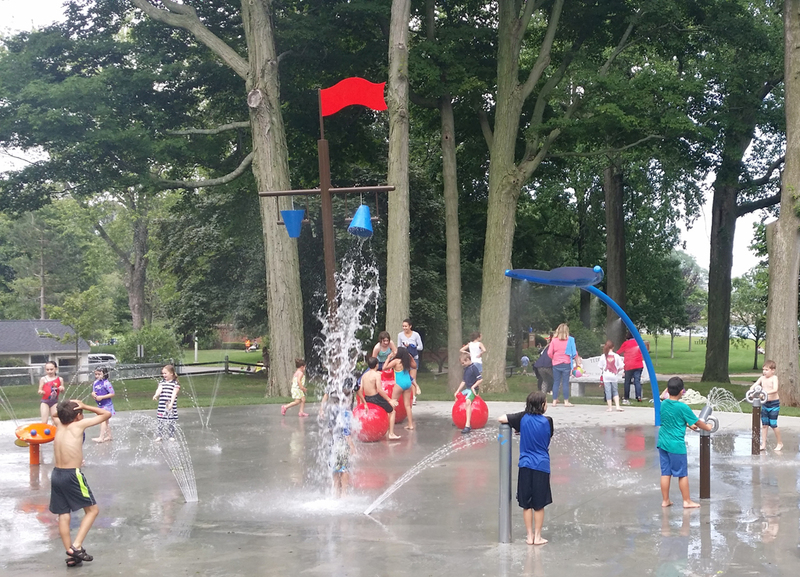 Ocean front project with a Pirate thematic. 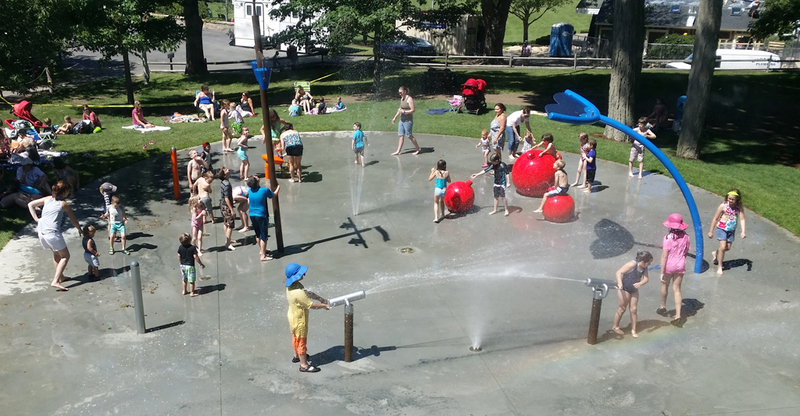 Giant Grenades, Whale Tail, Ship Mast with 2 spilling buckets and 2 cannons. 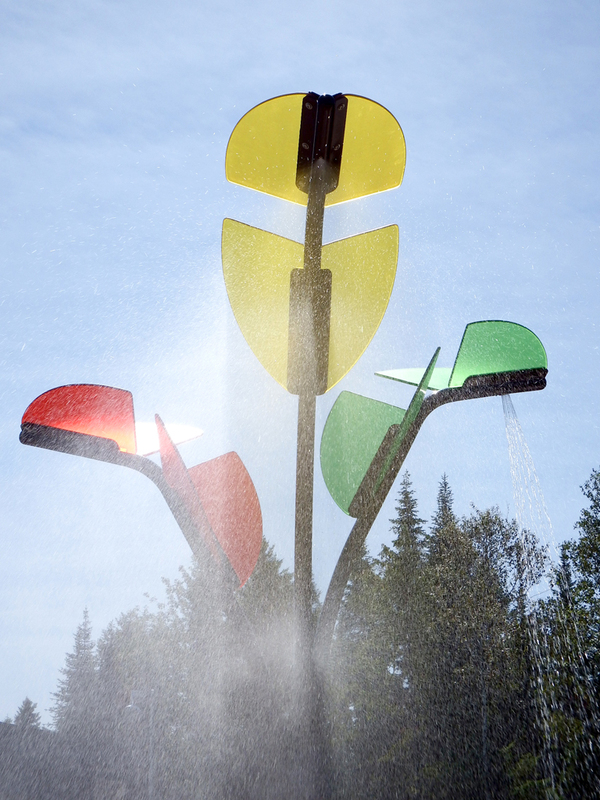 Several ground jets were also integrated in the design. 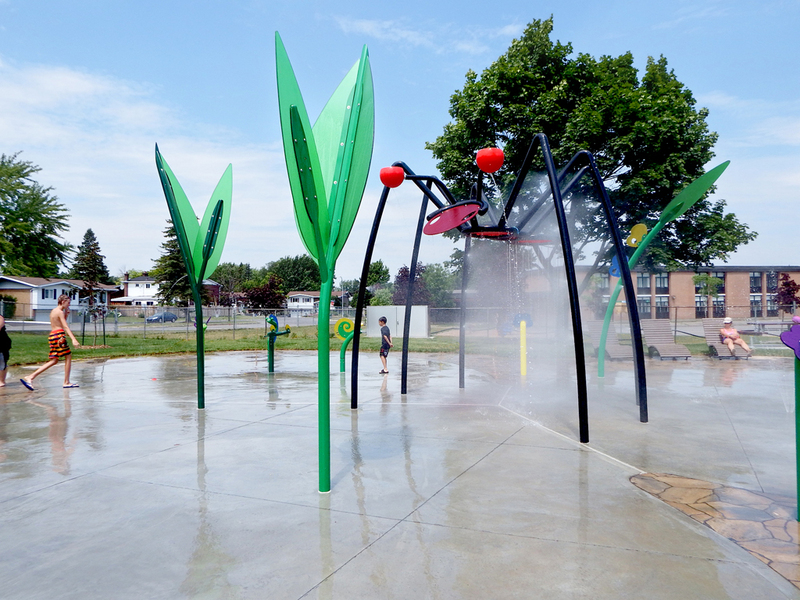 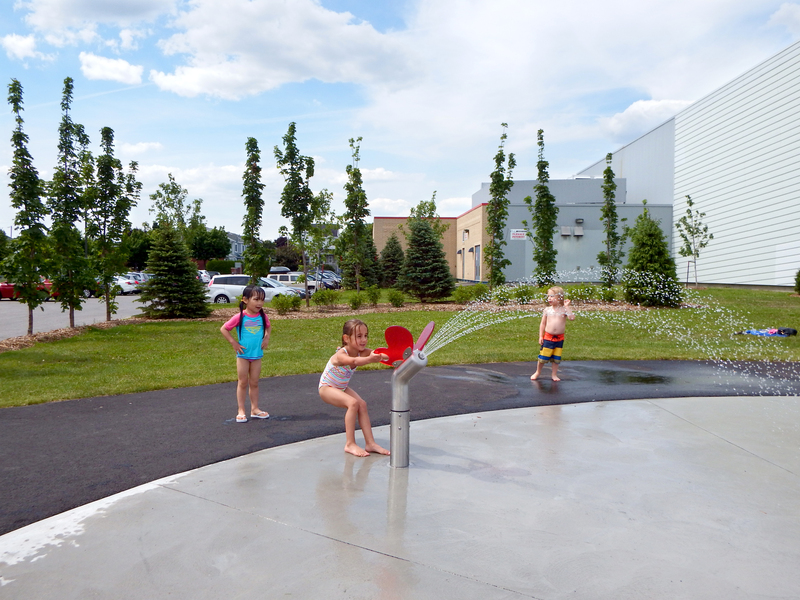 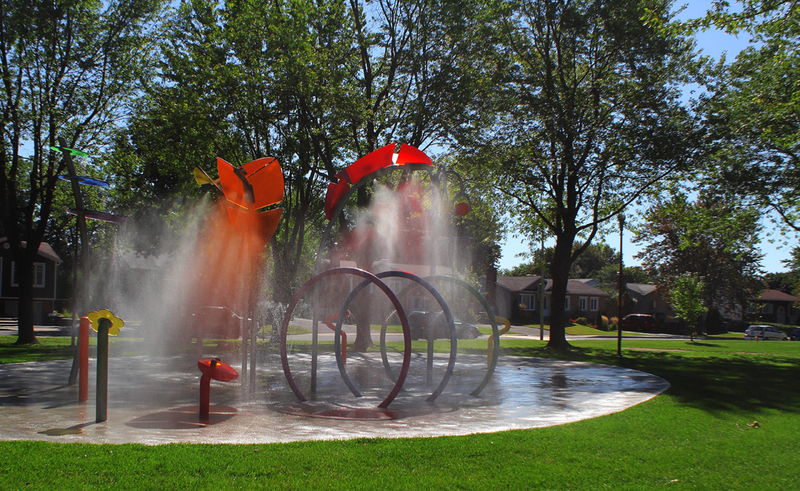 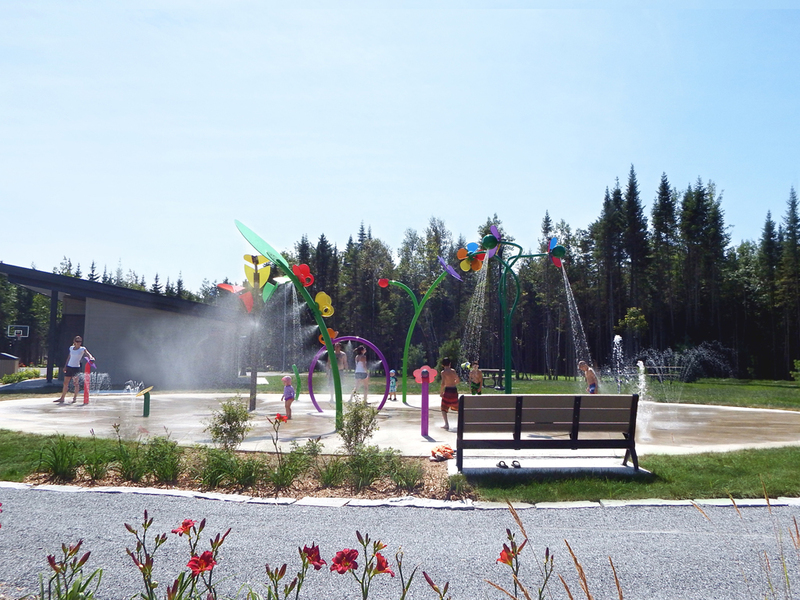 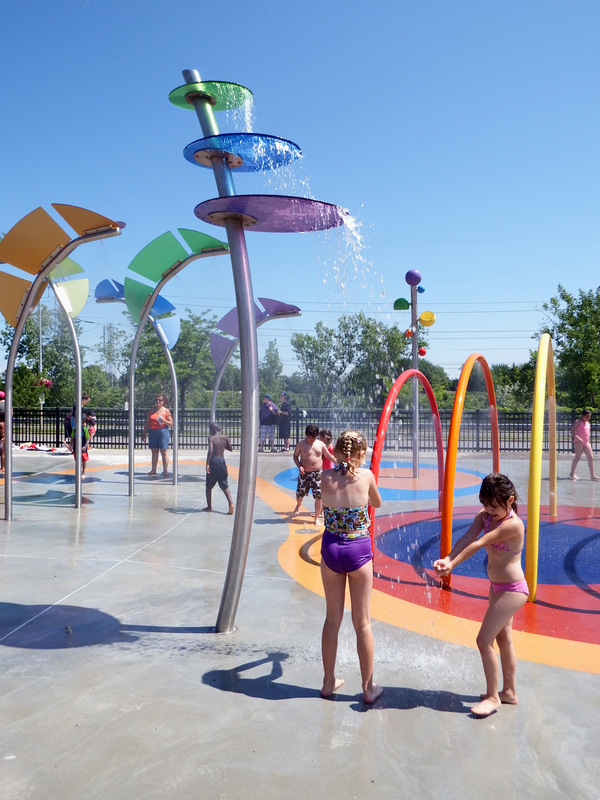 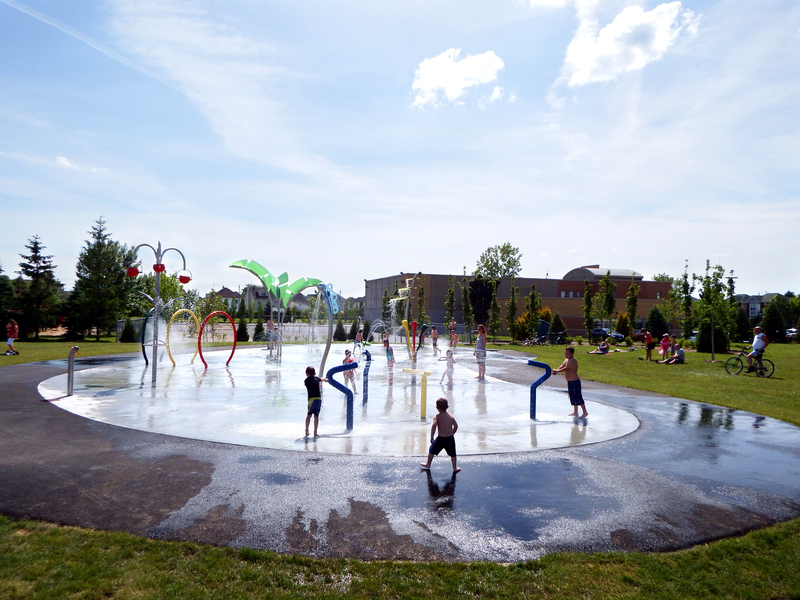 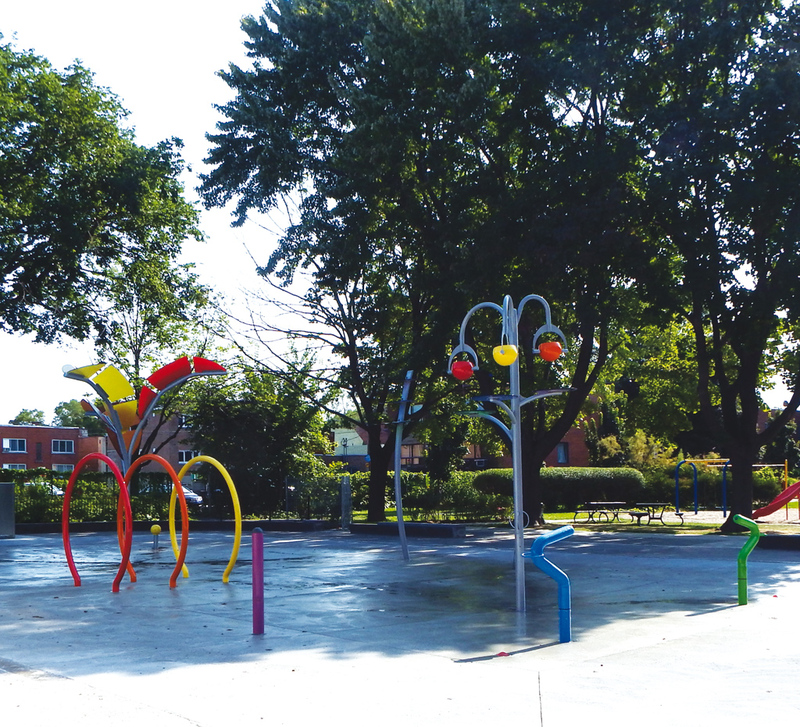 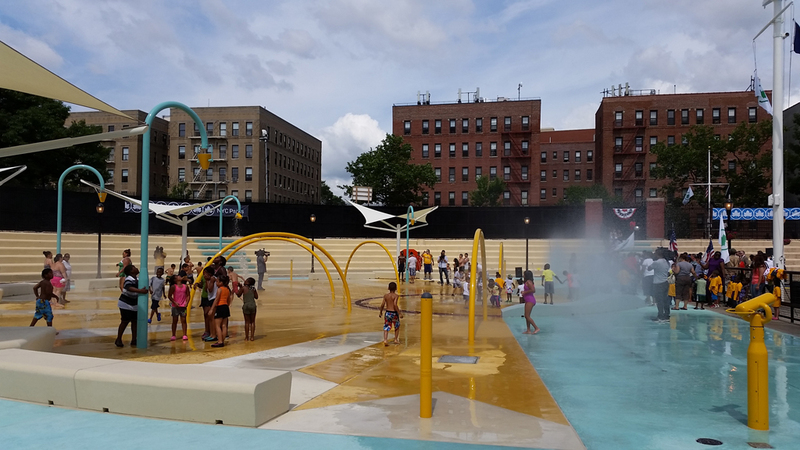 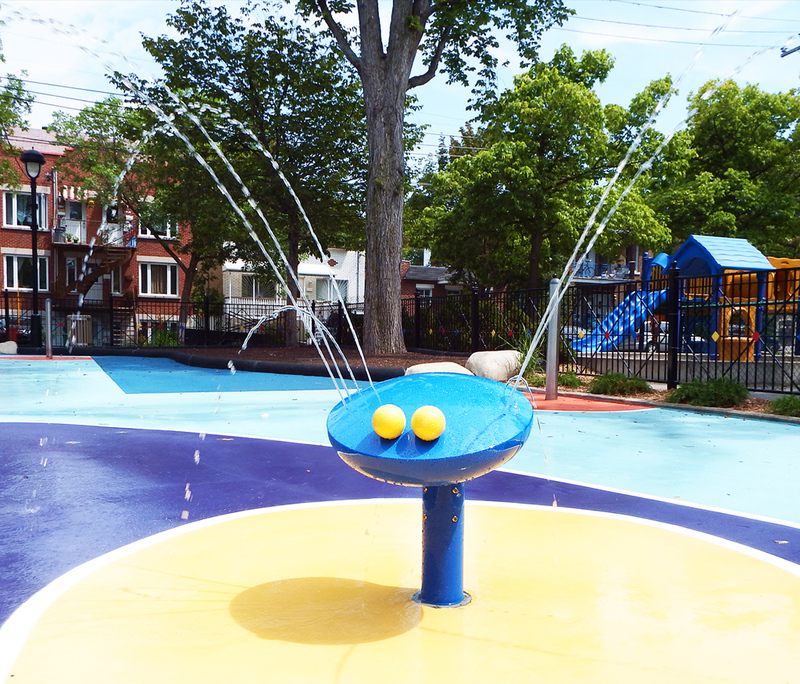 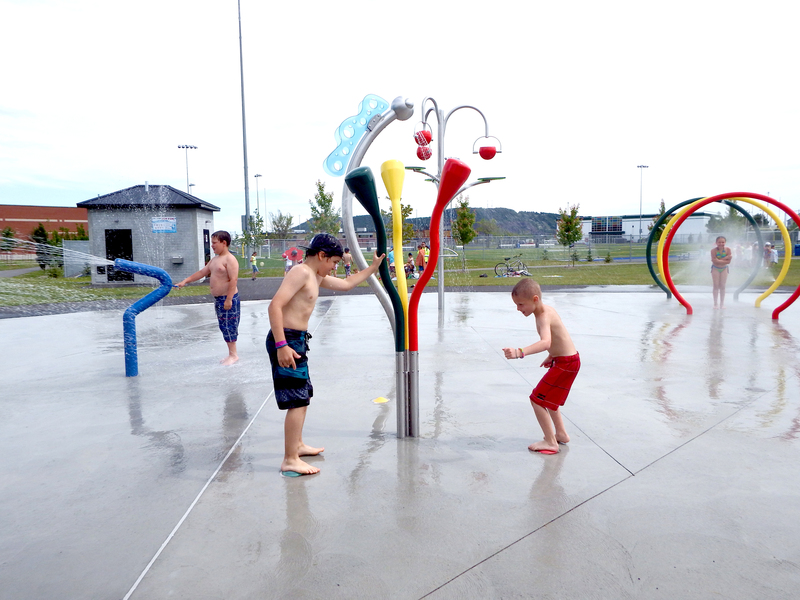 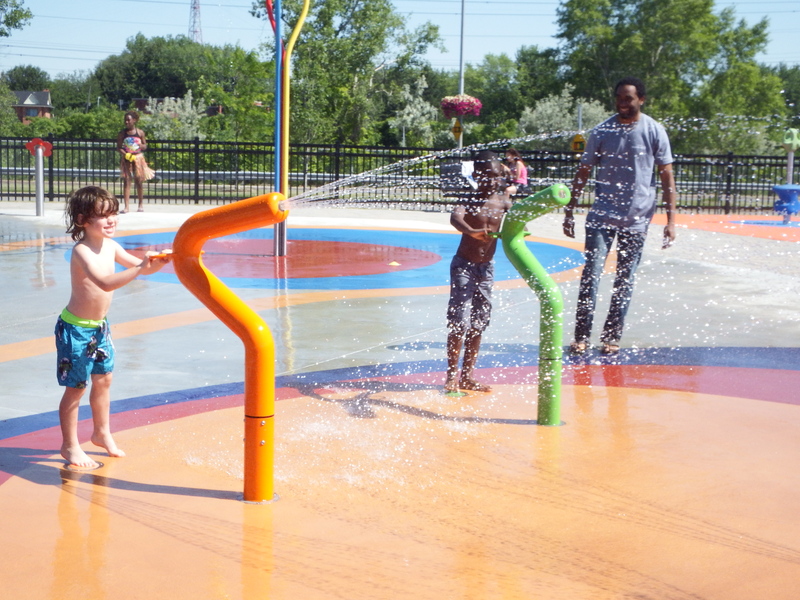 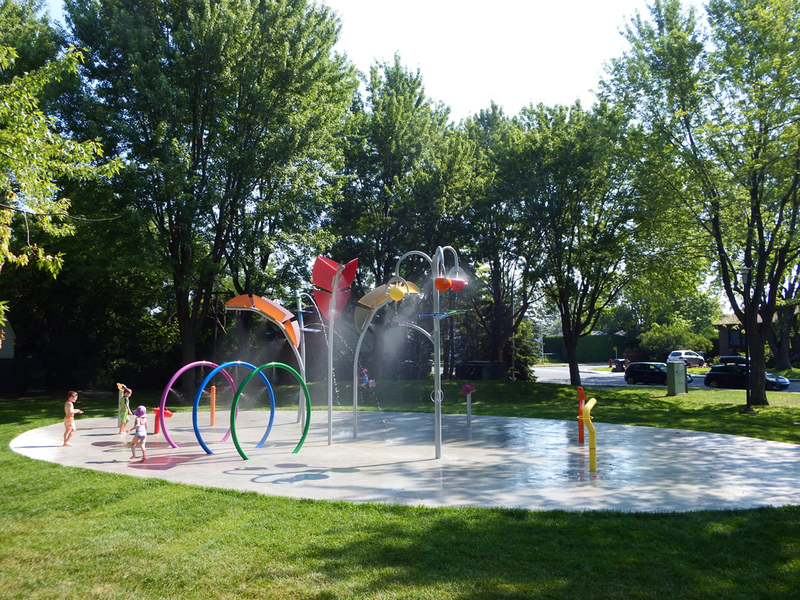 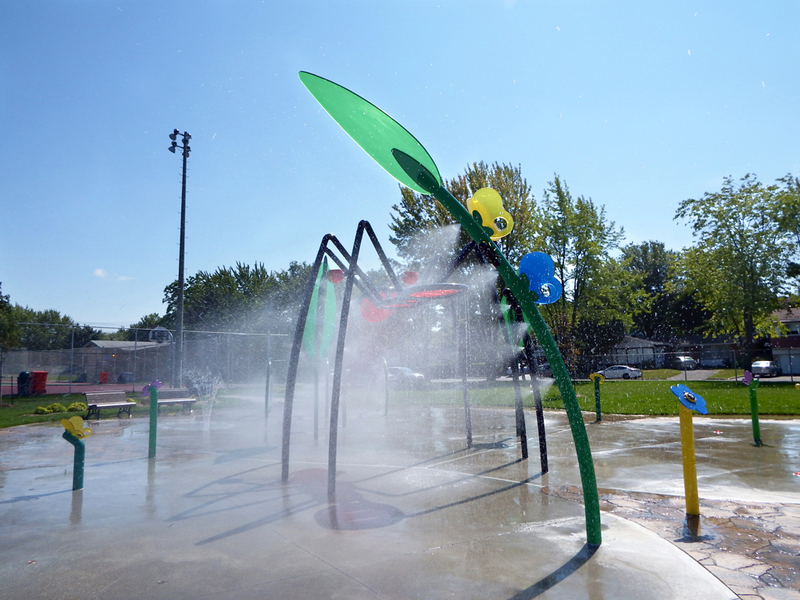 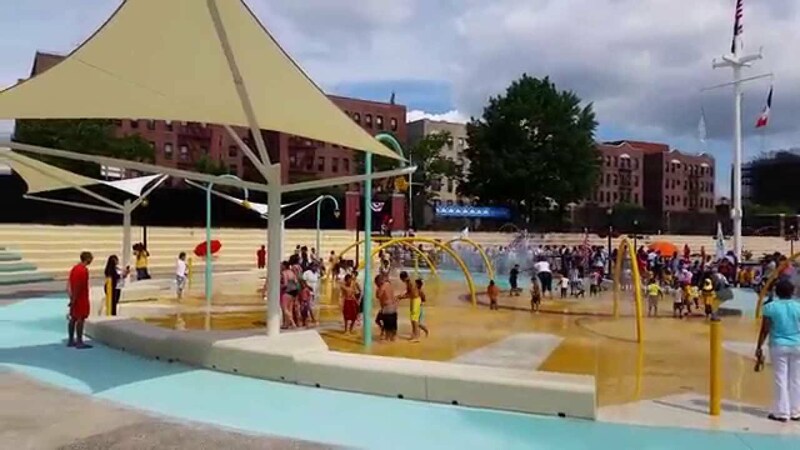 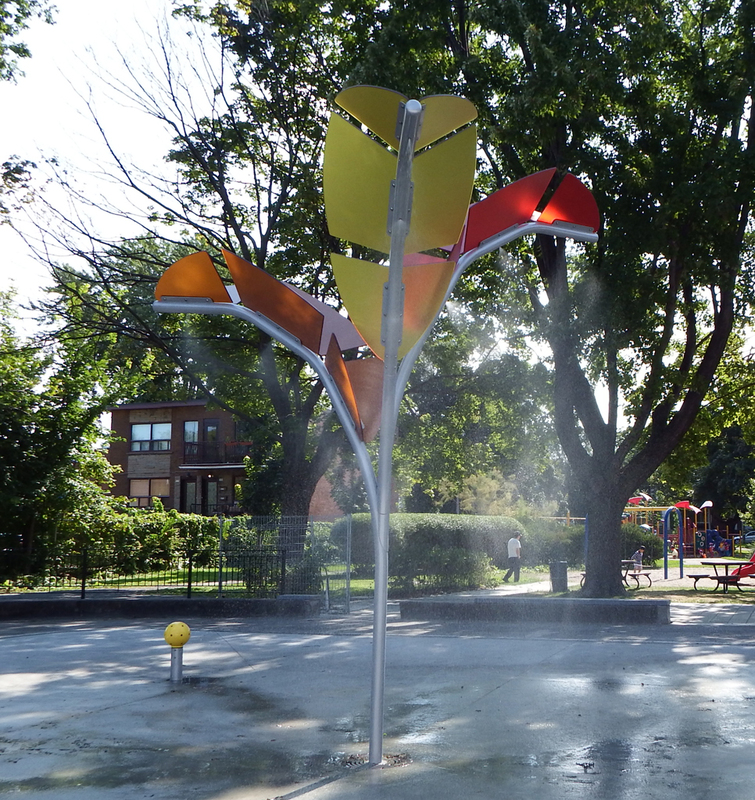 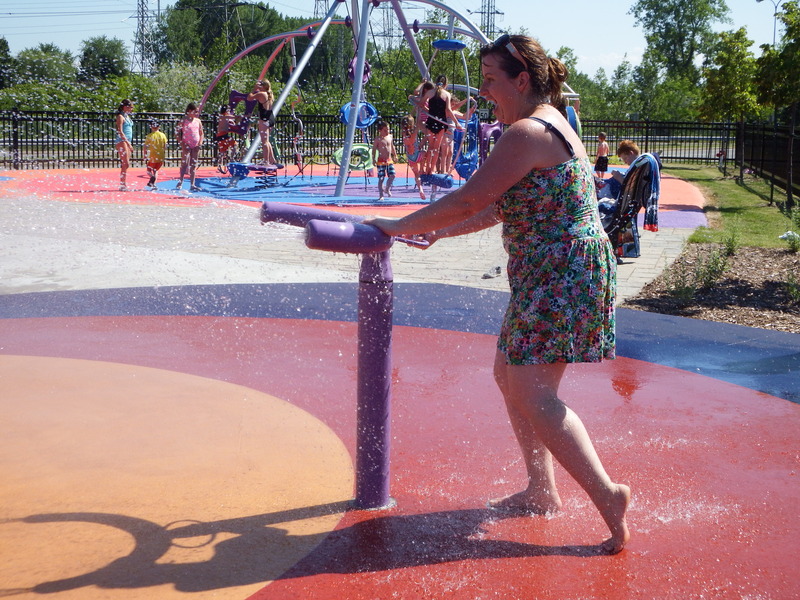 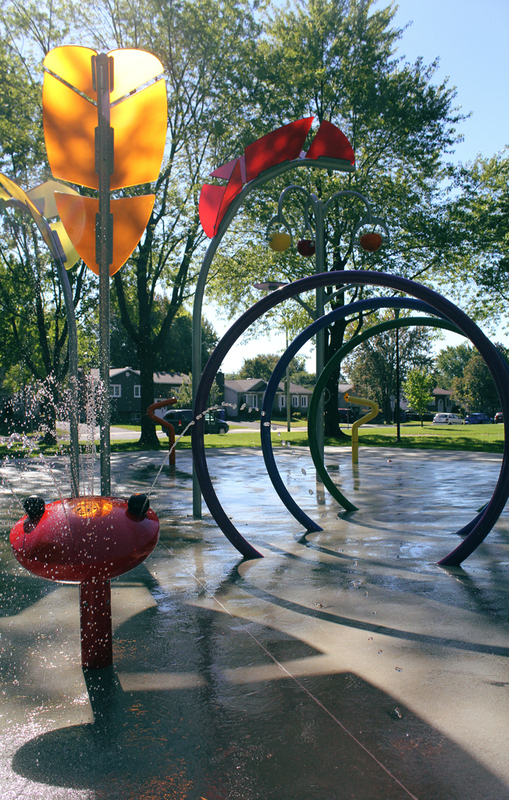 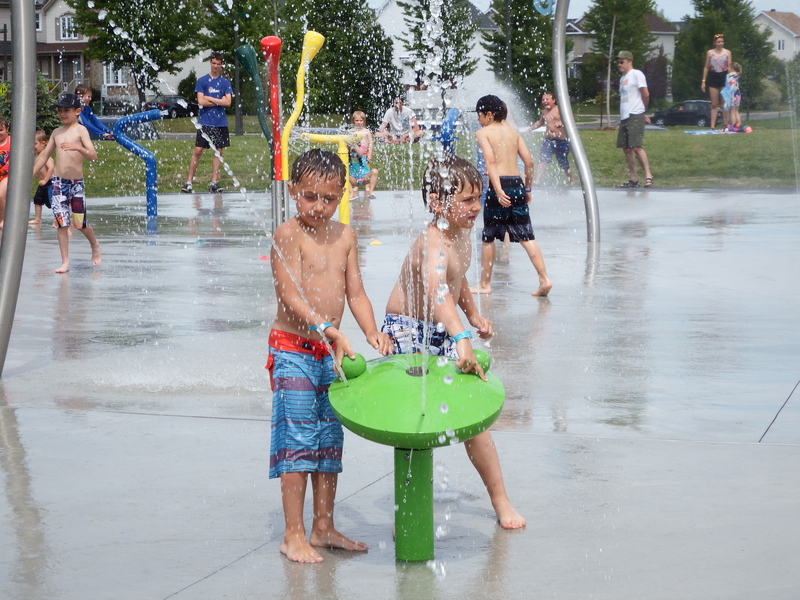 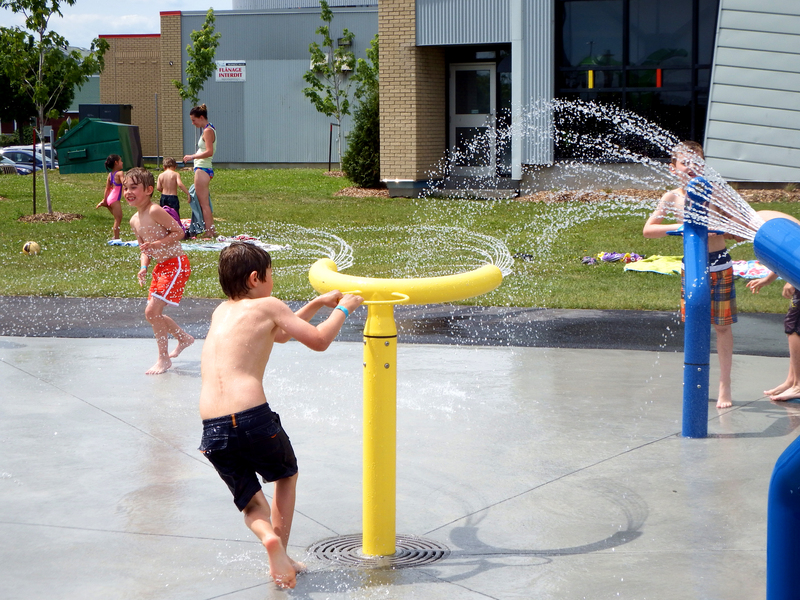 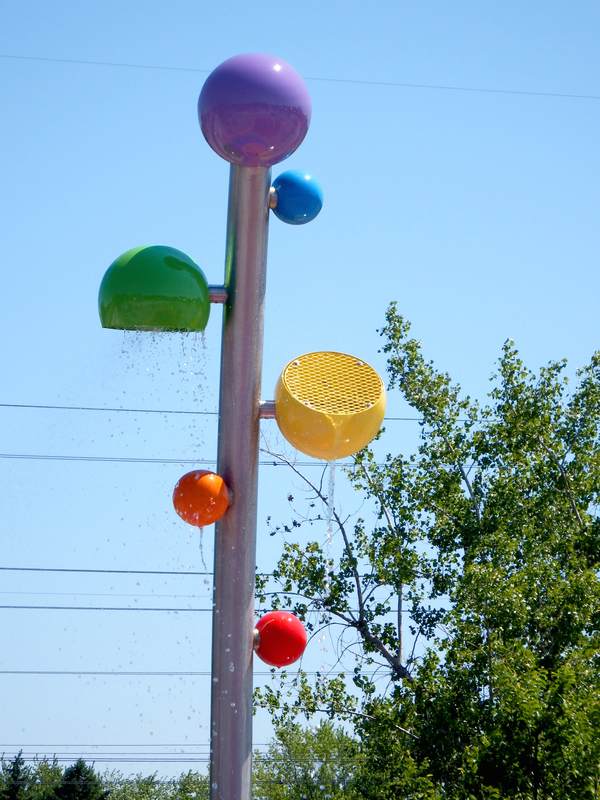 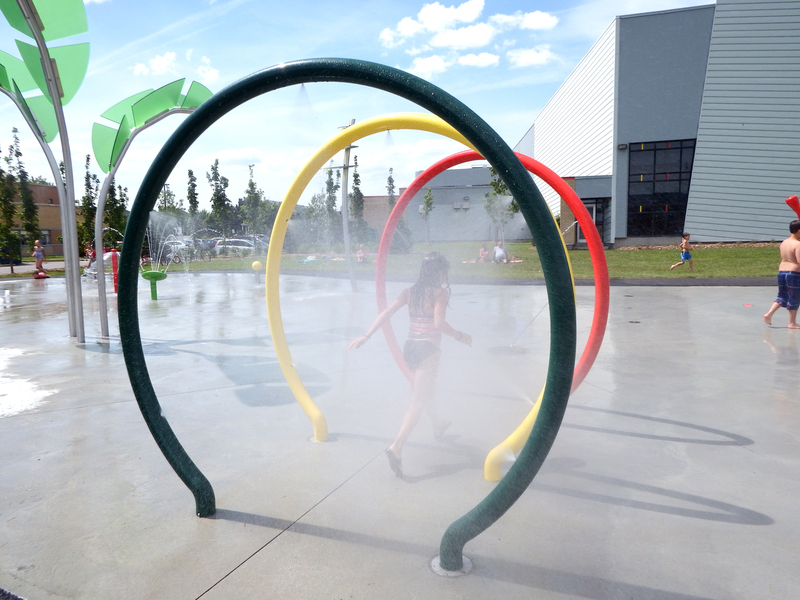 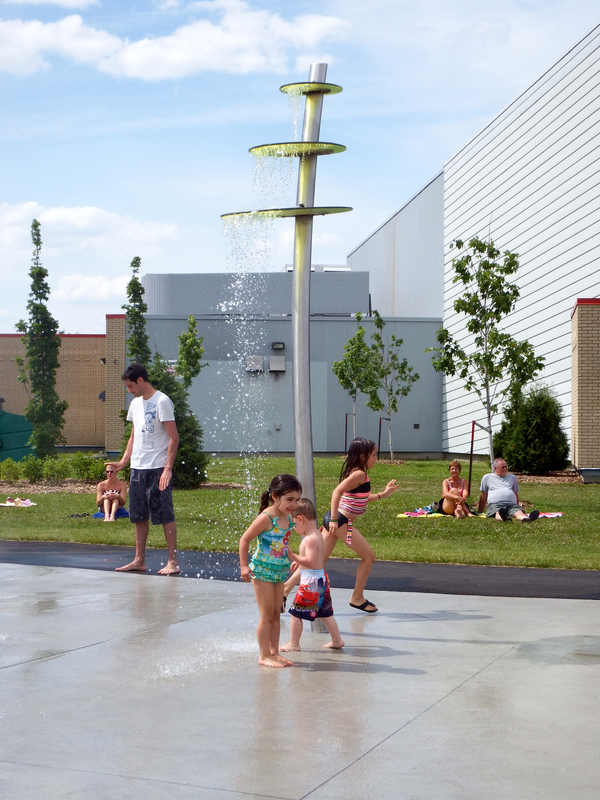 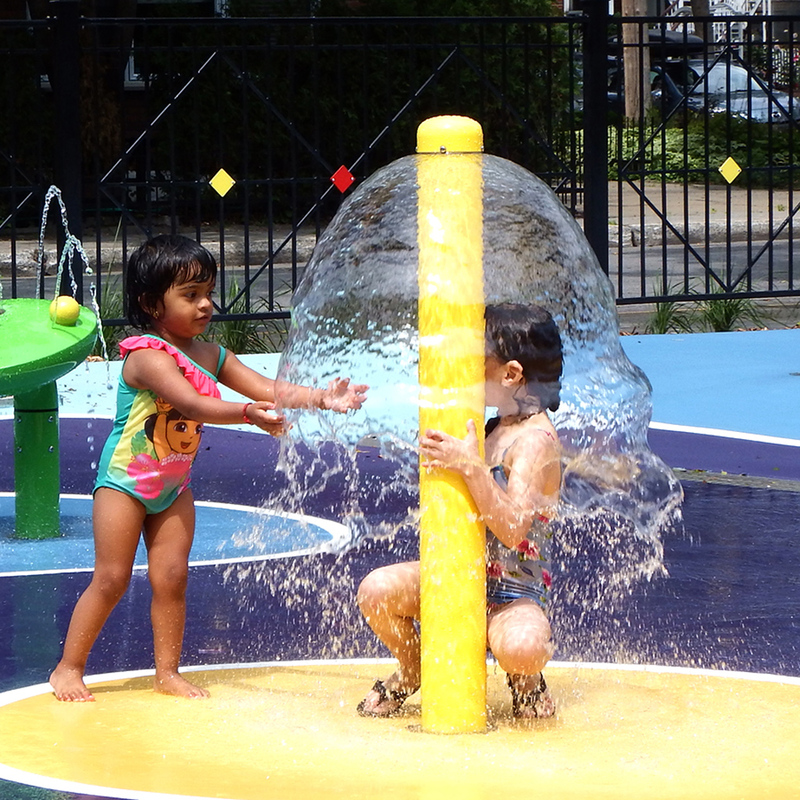 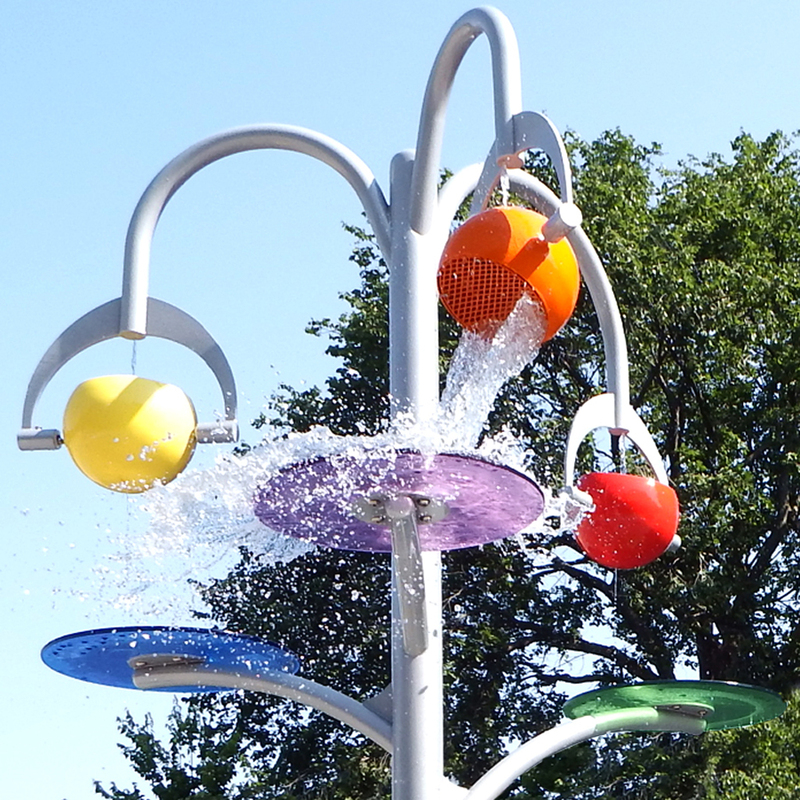 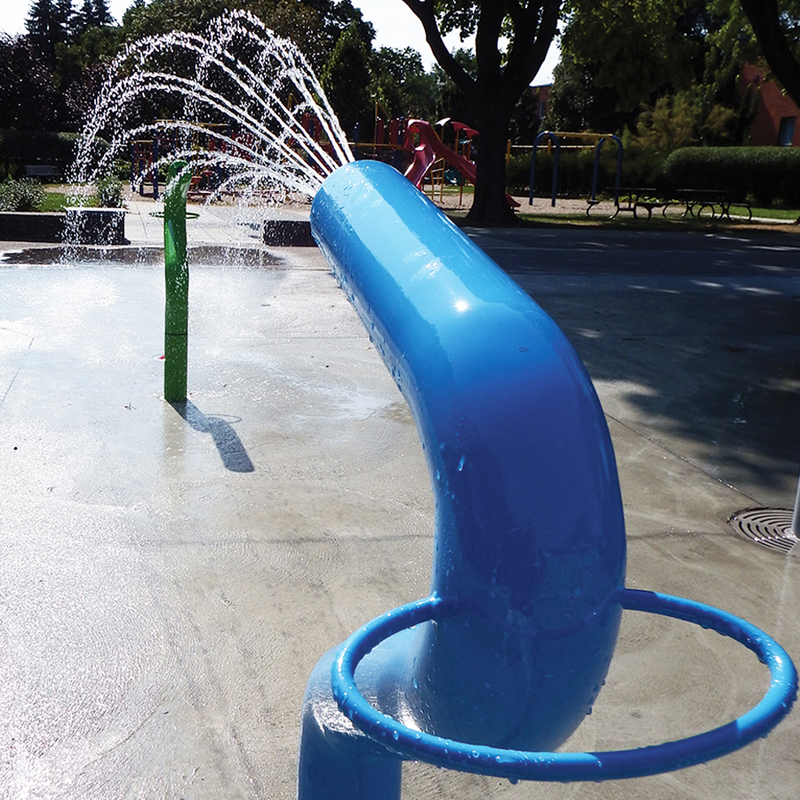 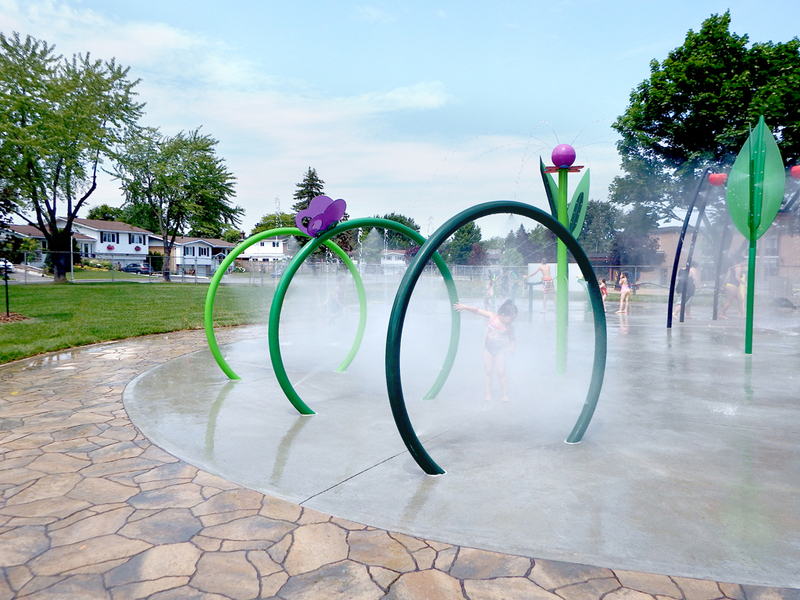 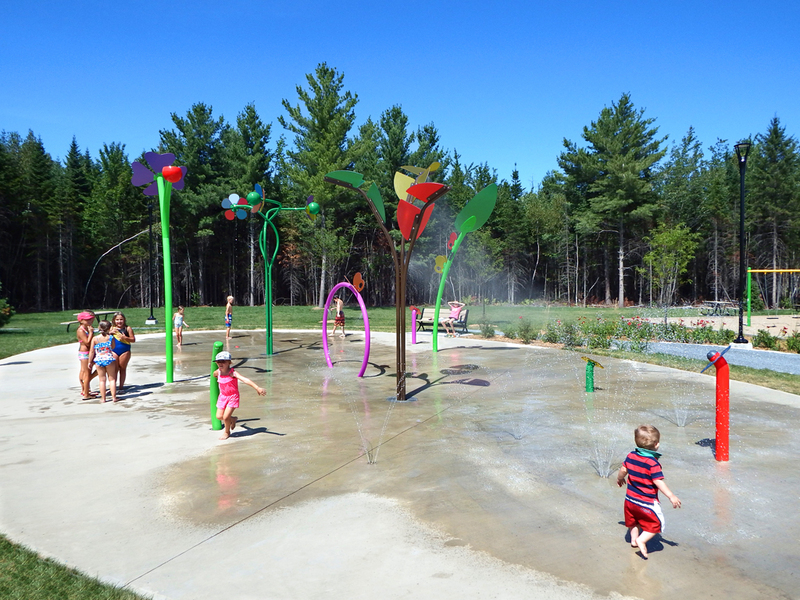 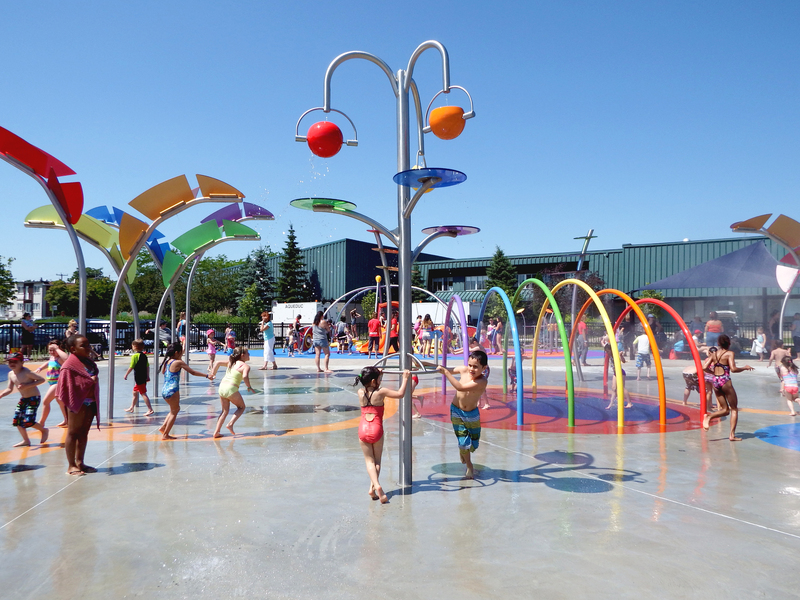 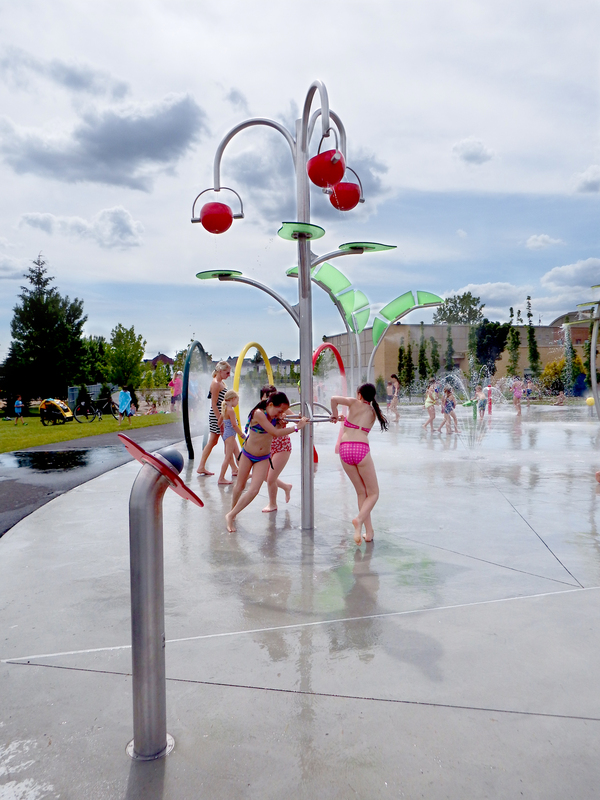 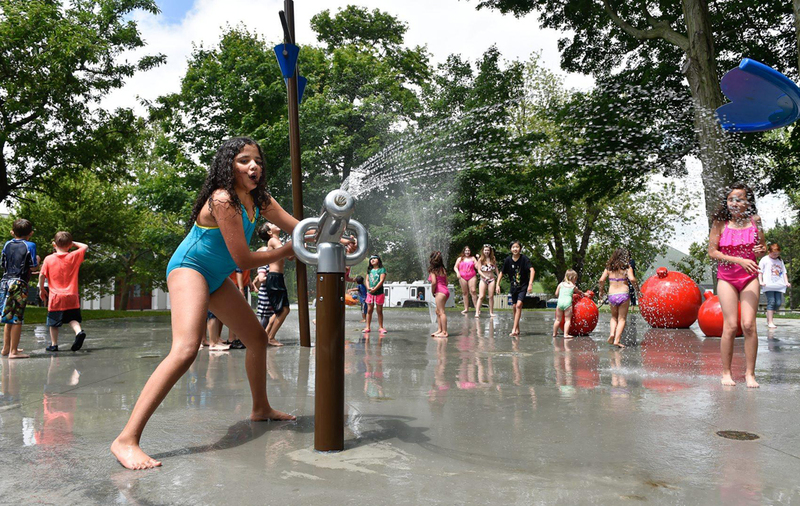 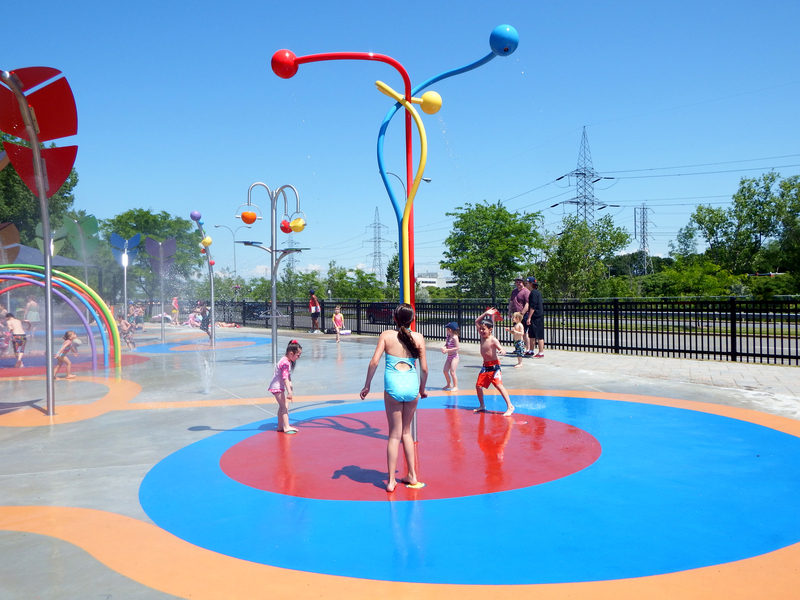 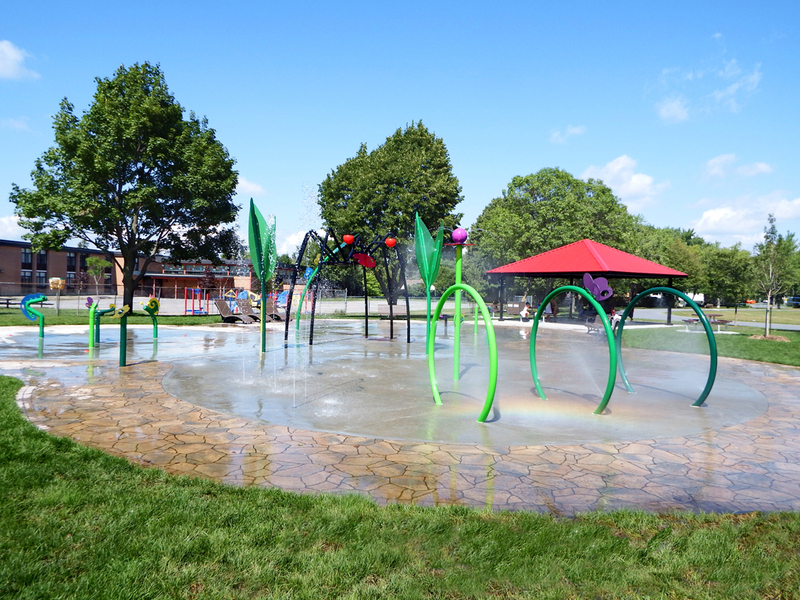 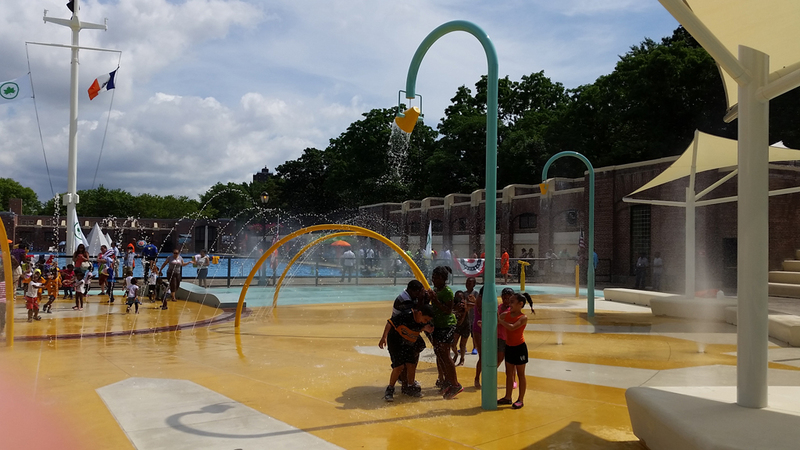 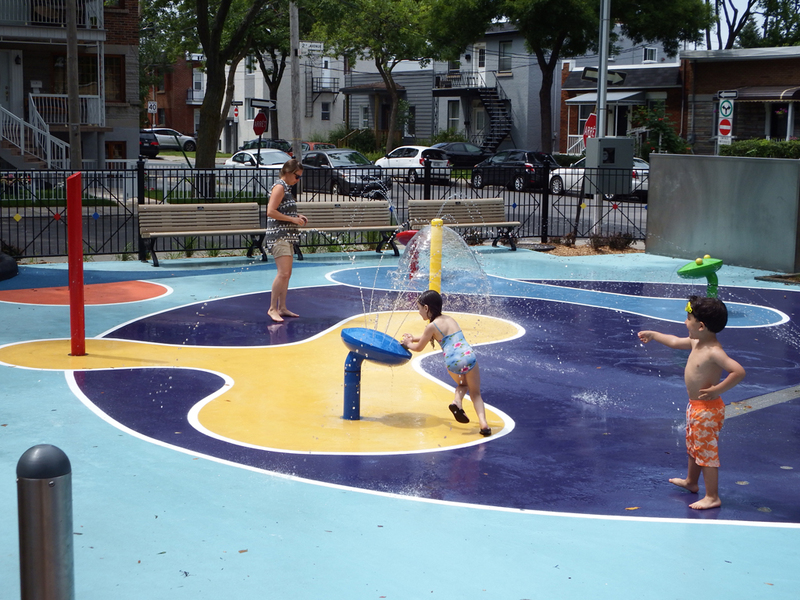 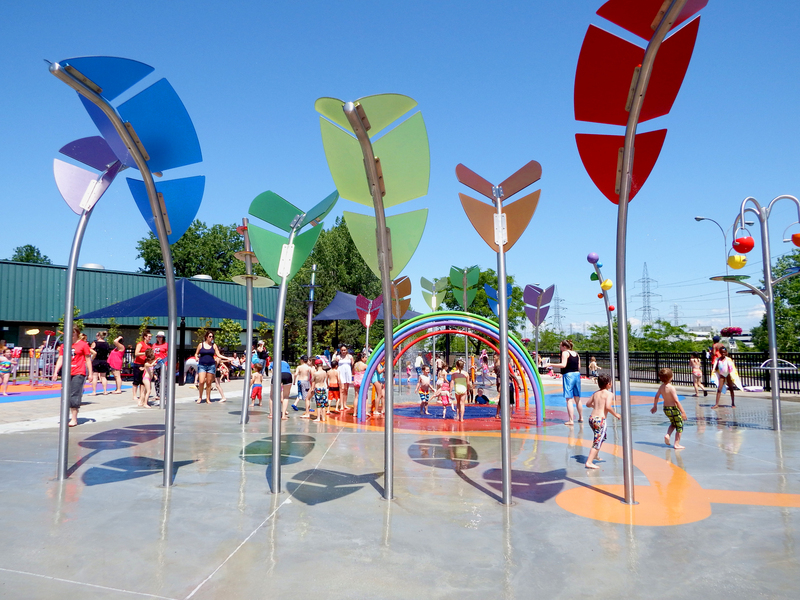 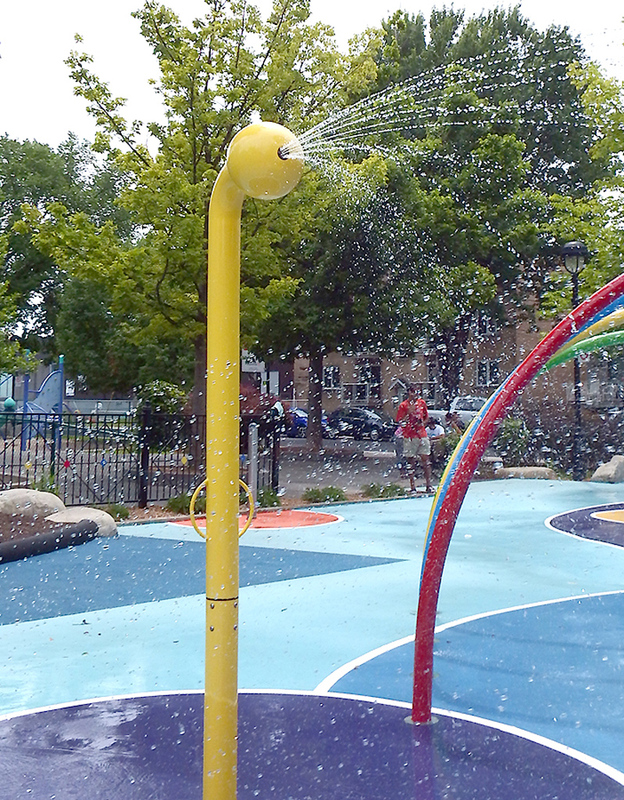 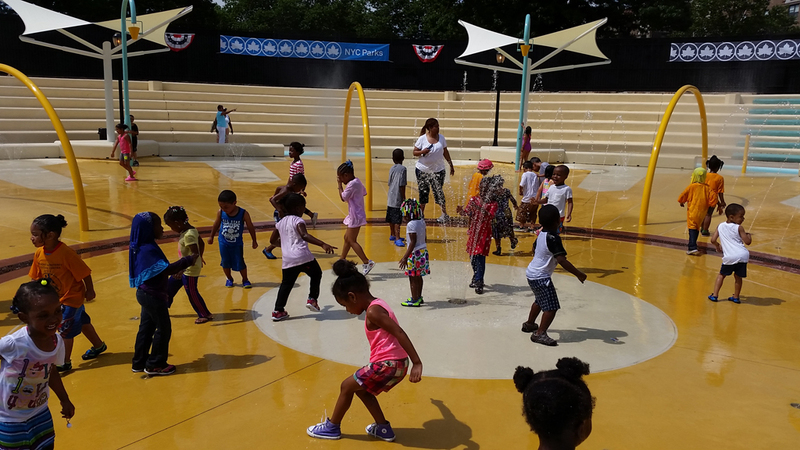 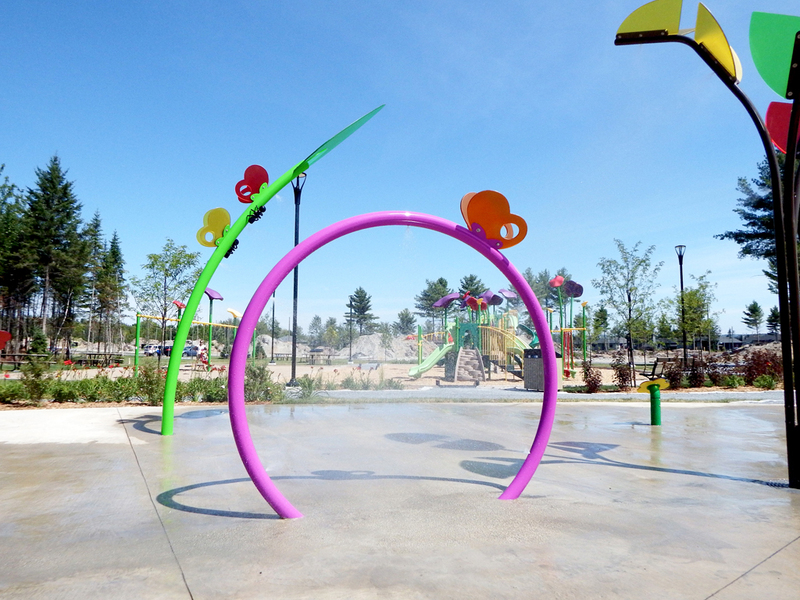 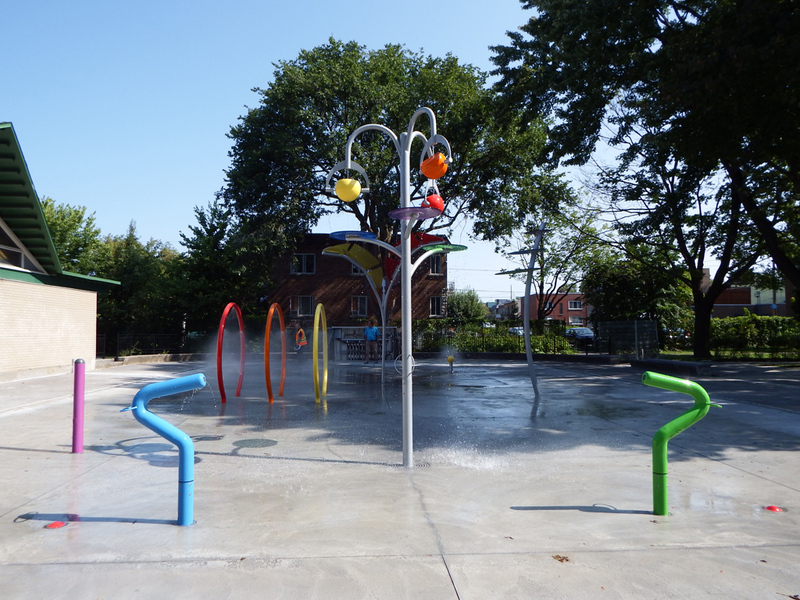 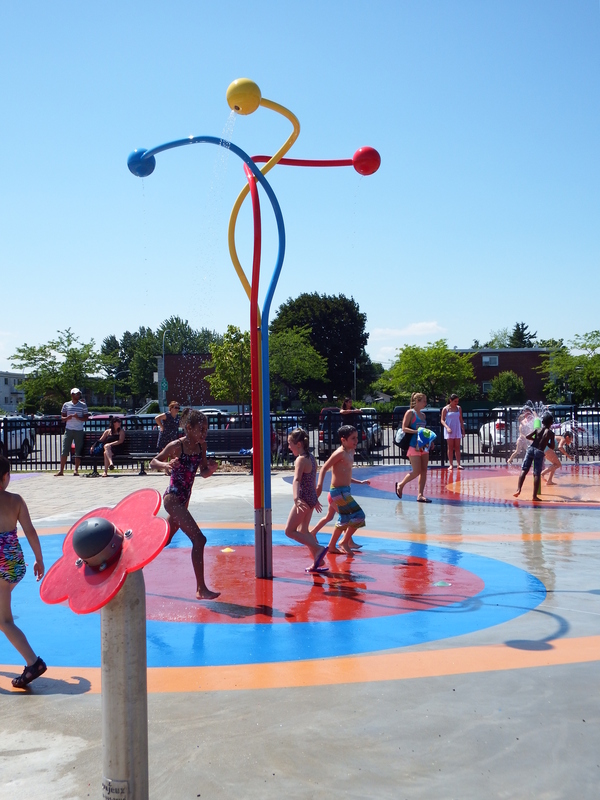 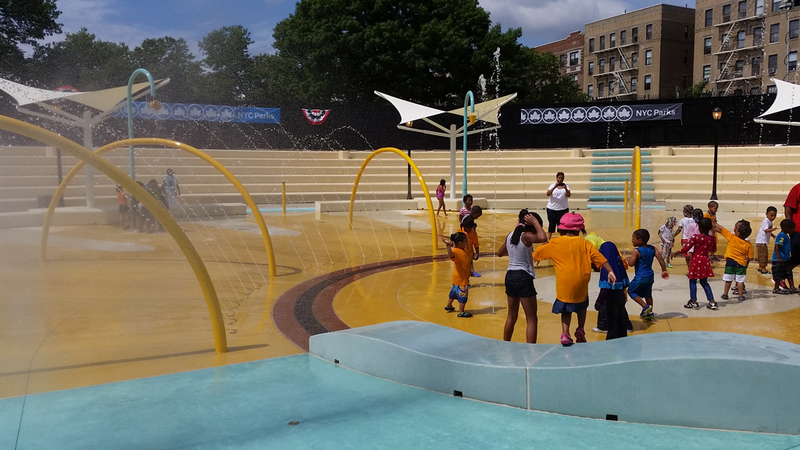 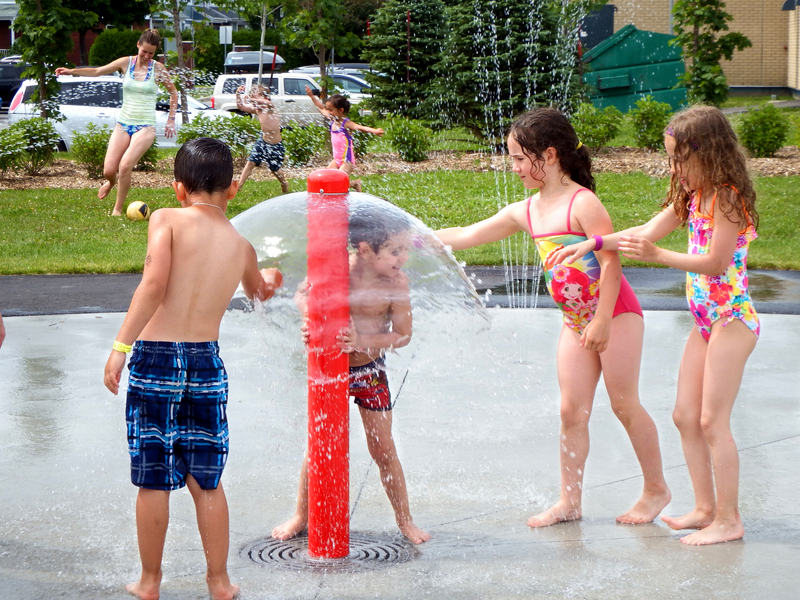 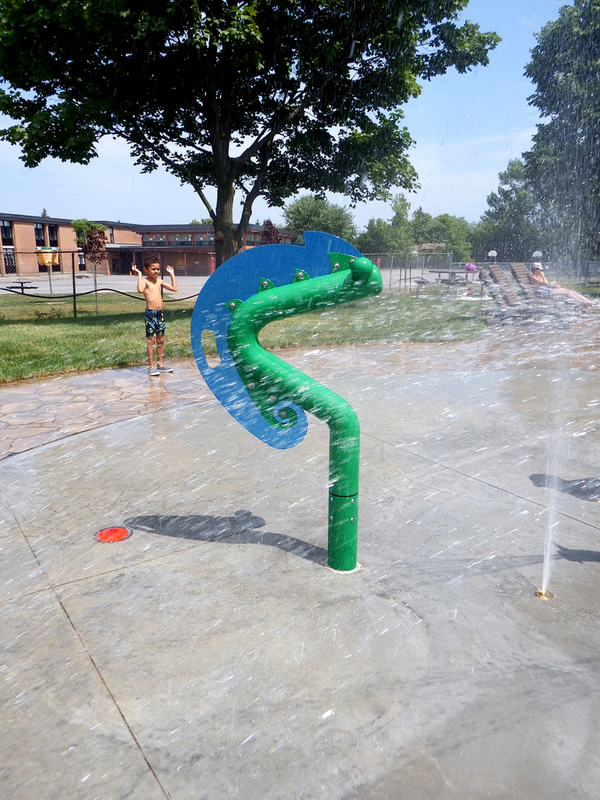 Spray park with classic components such as a Water Bell and an interactive periscope. 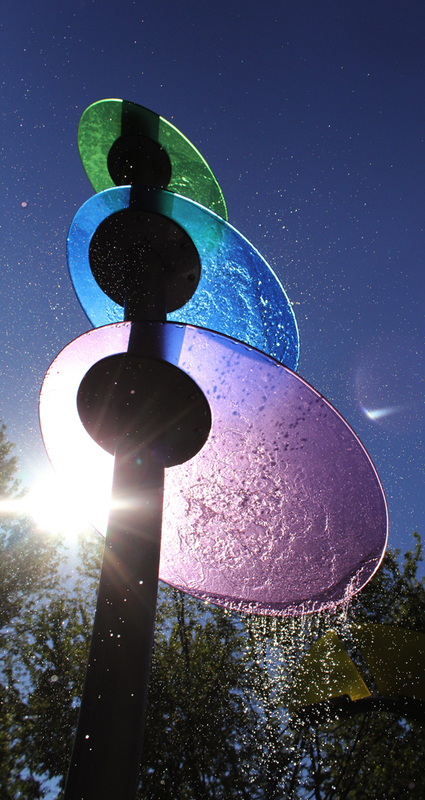 See how our Ecolor polymers reflect light in an exceptional and spectacular array of colors. 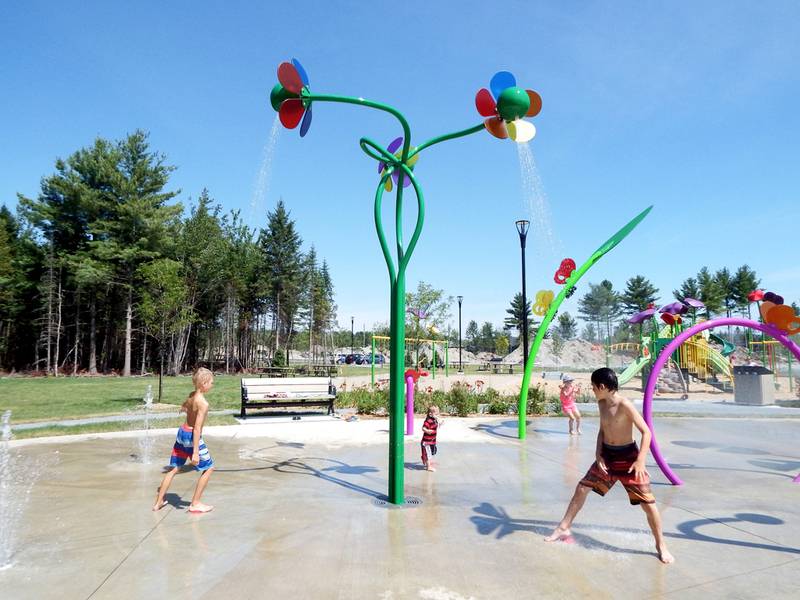 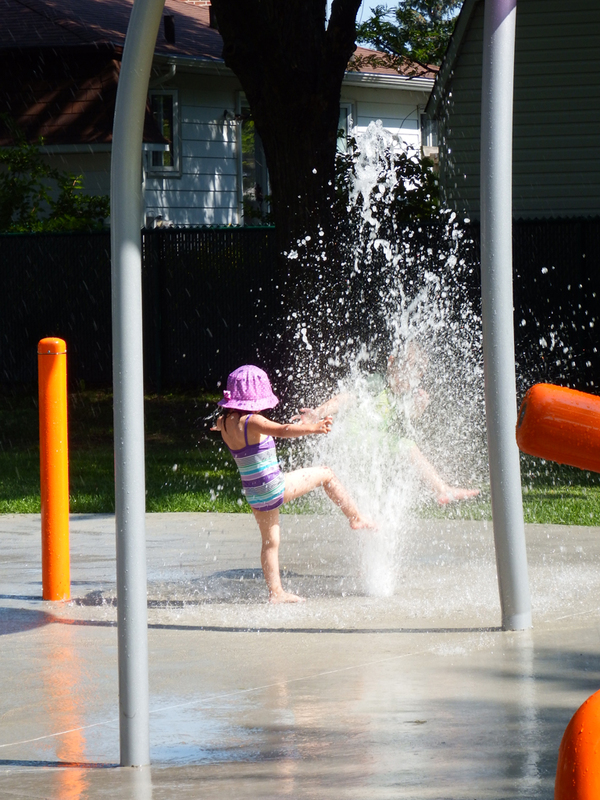 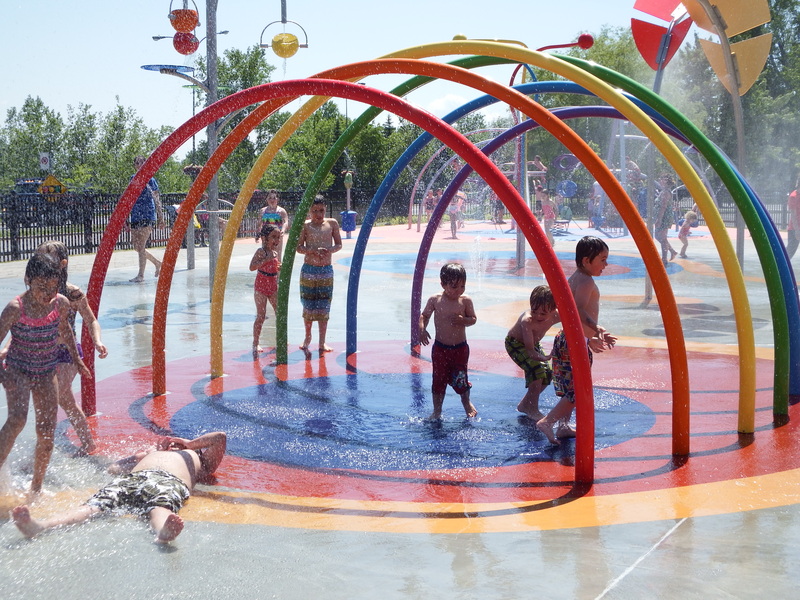 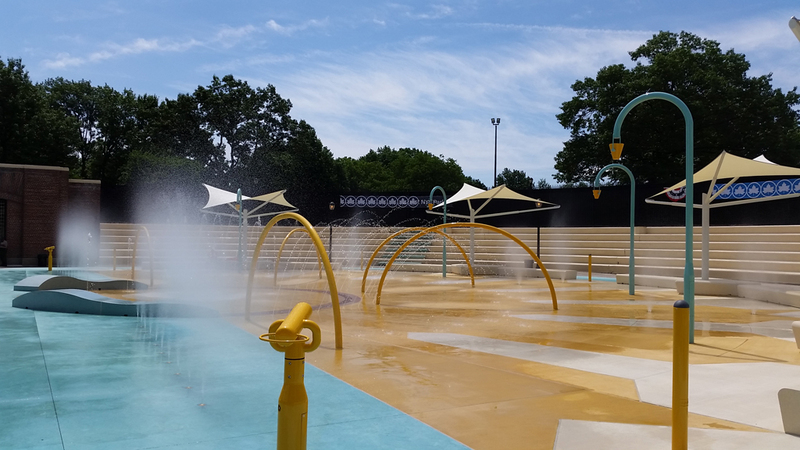 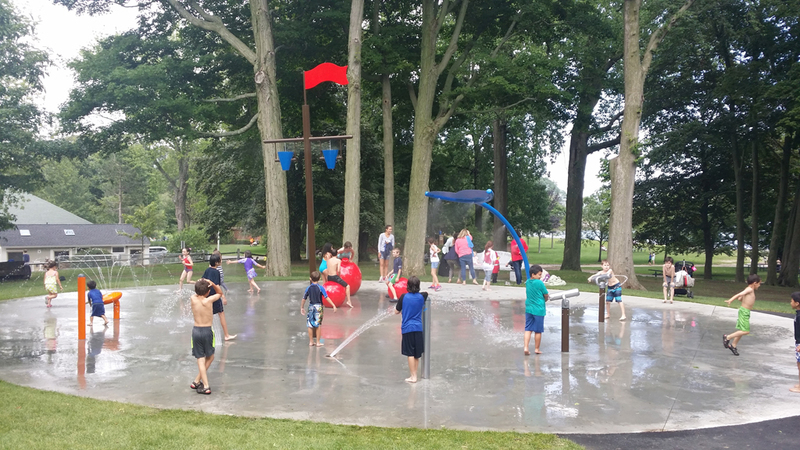 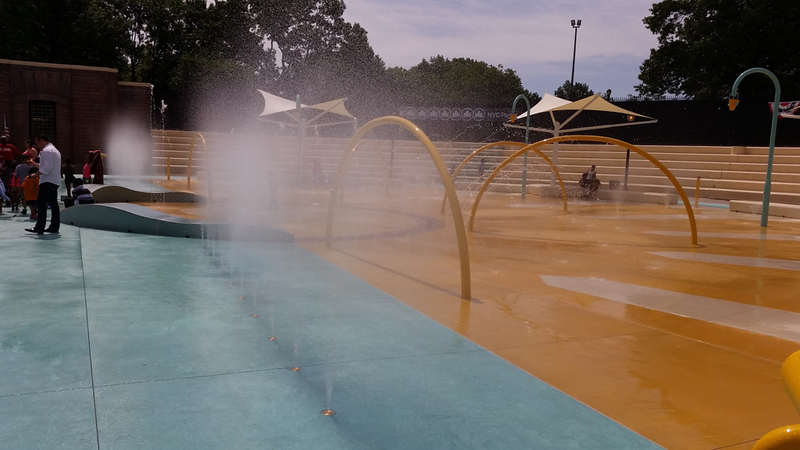 Spray park with Aqualand components such as our Philo Phyte model #5173. 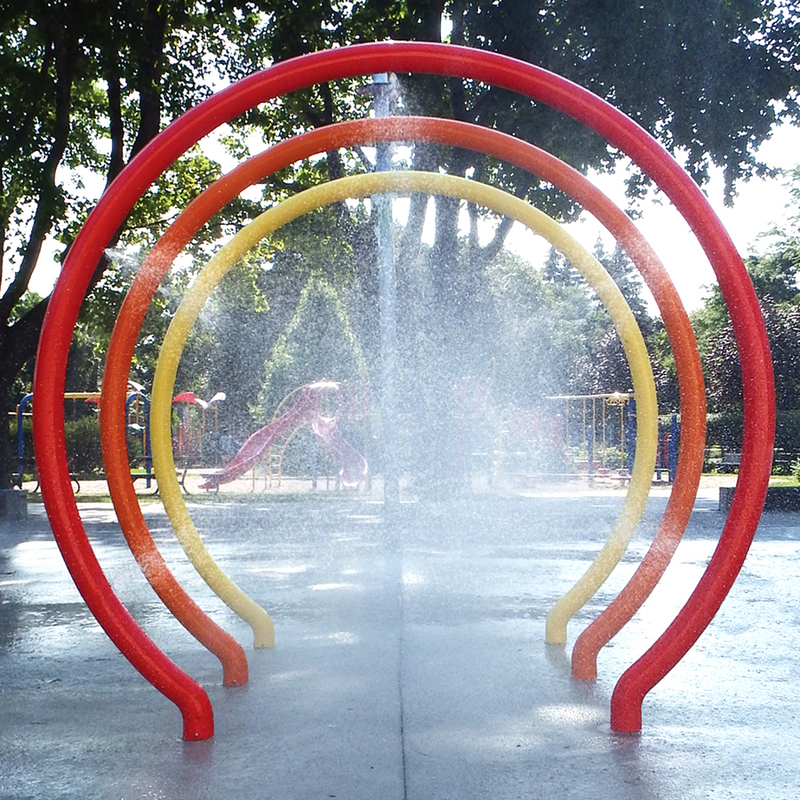 Design built in concentric half circles with at the first level a central circle of ground jets, at the second level, a series of arches and at the third level, a series of spilling buckets mounted on a cane shaped post. 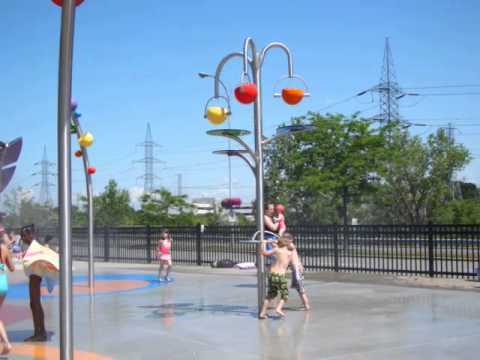 This project has an activation and an electronic control system combined with our fully mechanical push-button type MA directly mounted on the canes. 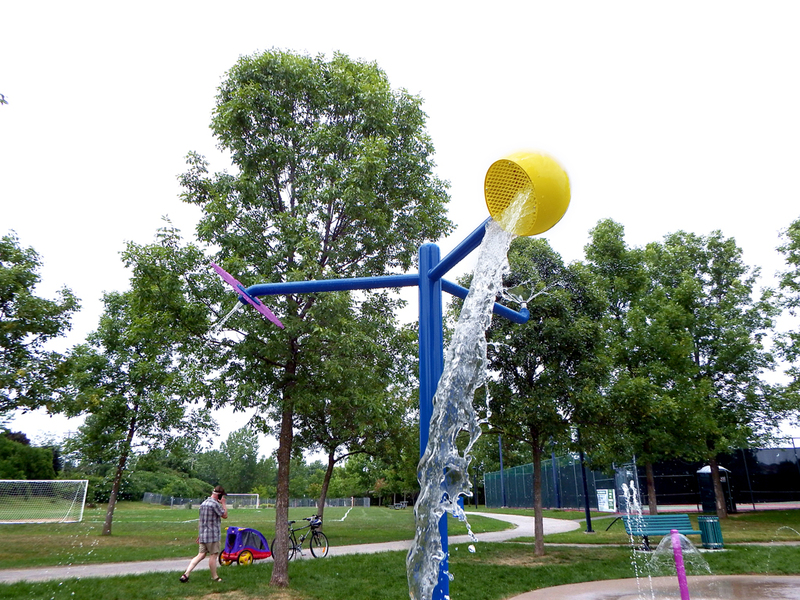 The advantage of this combination of controls is to allow the user to play with a single spilling bucket without having to activate all water features. 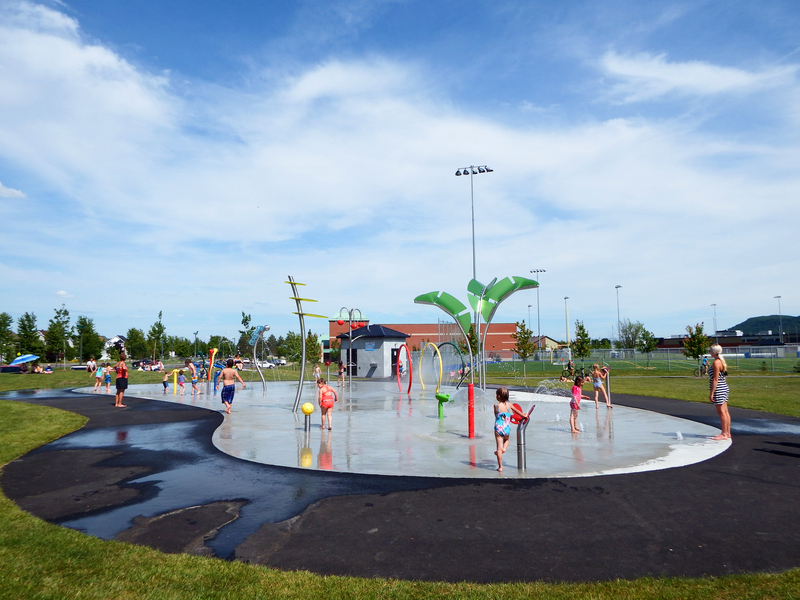 Moreover, because the city designer did not want electrical wiring in the concrete slab, Aquajeux was able to offer a solution that met his needs. 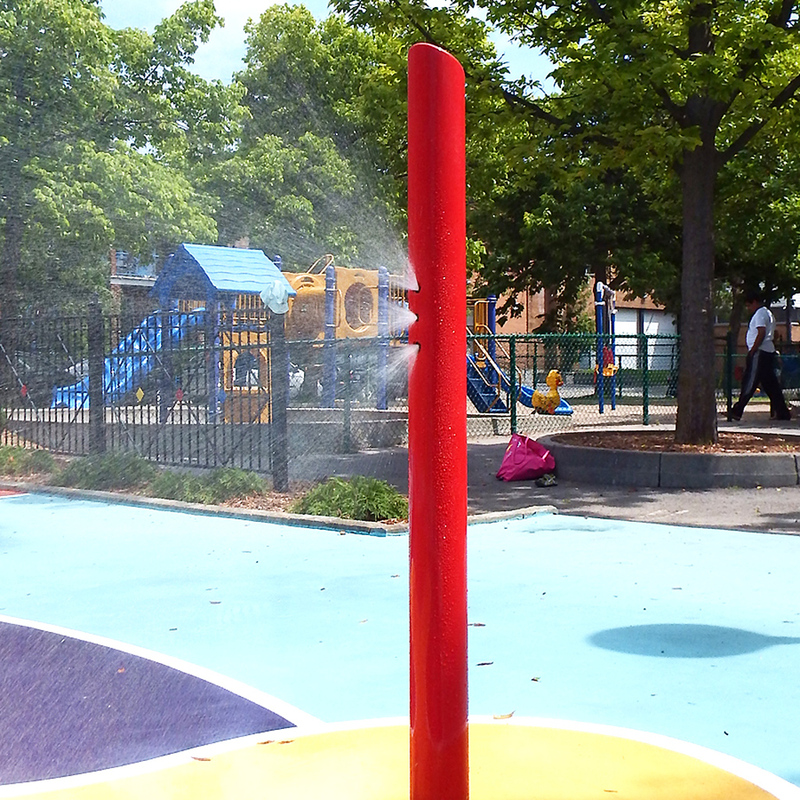 Classic spray pad. 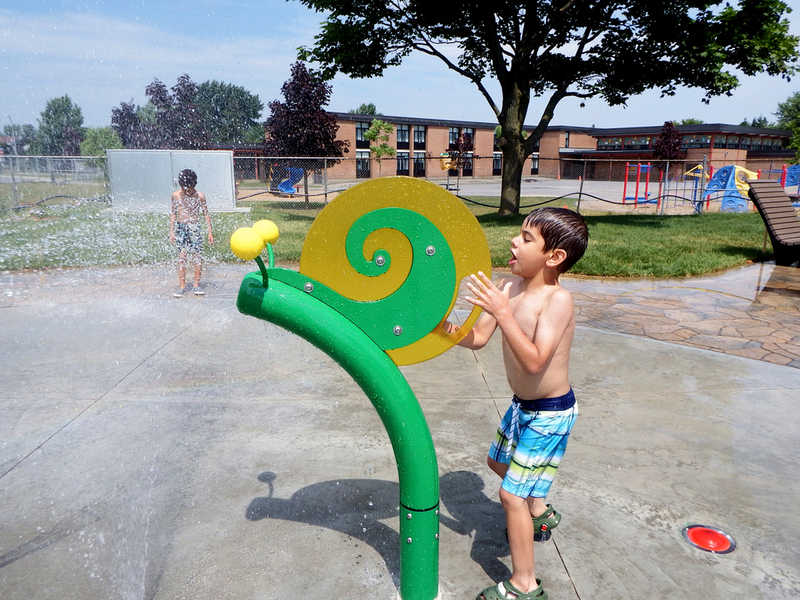 We can see our "Spinning Periscope" in yelleow. 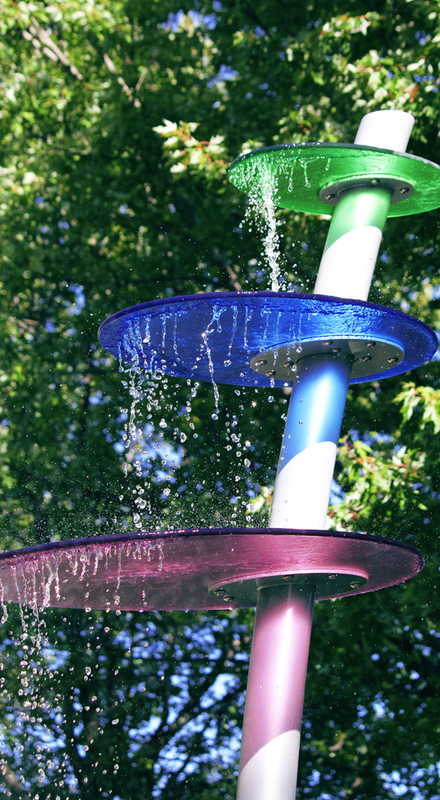 Classic water playground. 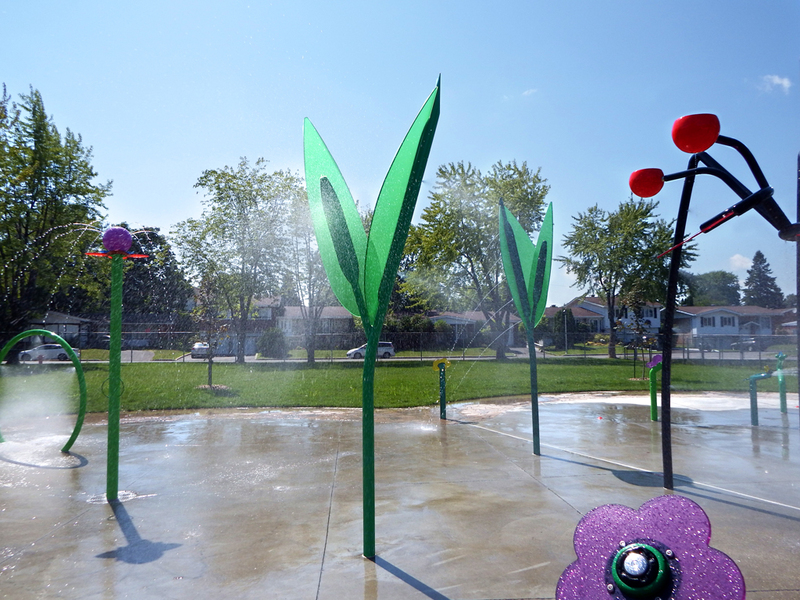 Interactive canons and periscope paired with arches. 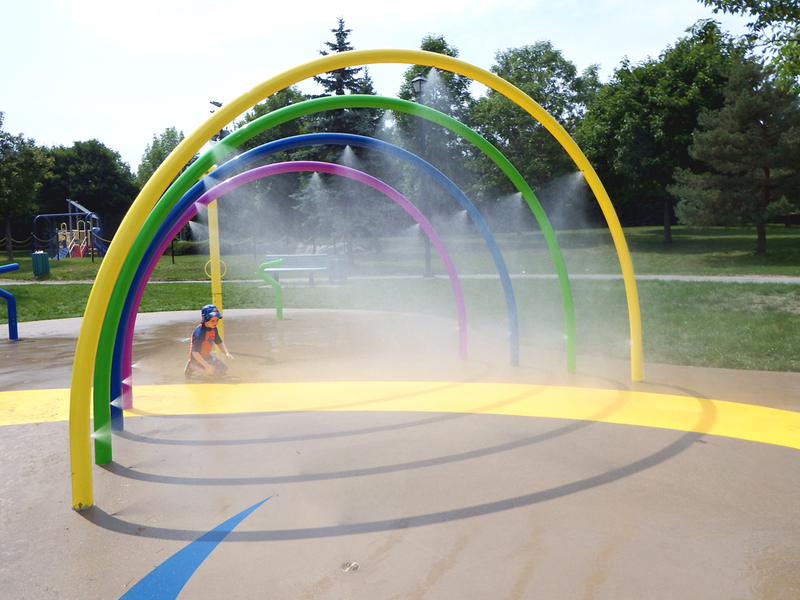 Aquatic play area with interactive spray features. 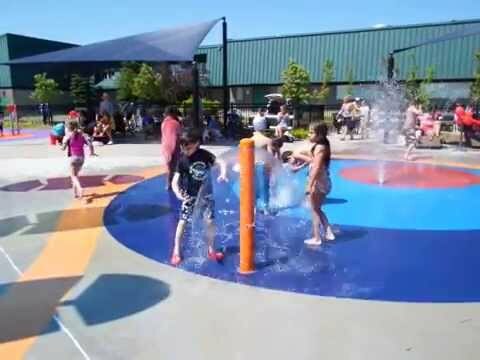 Aquajeux unique Step'n Play. 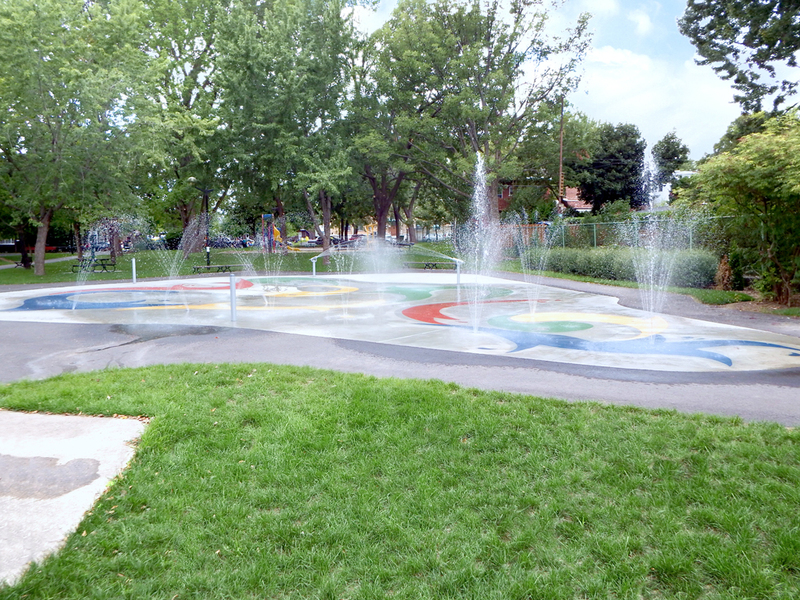 3 zones with several transition components.